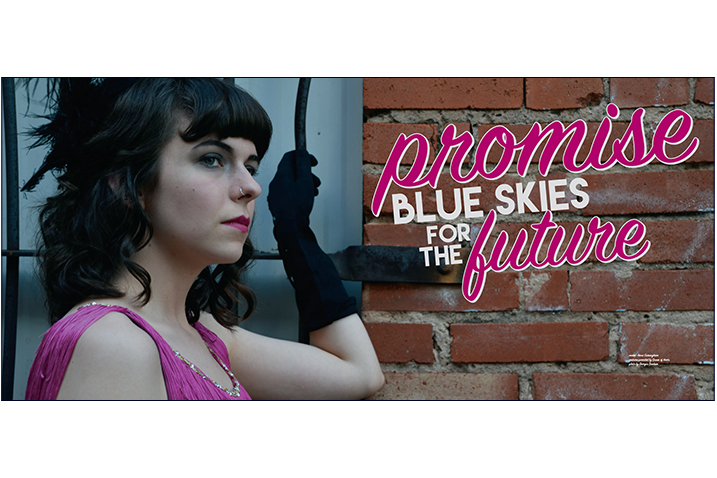 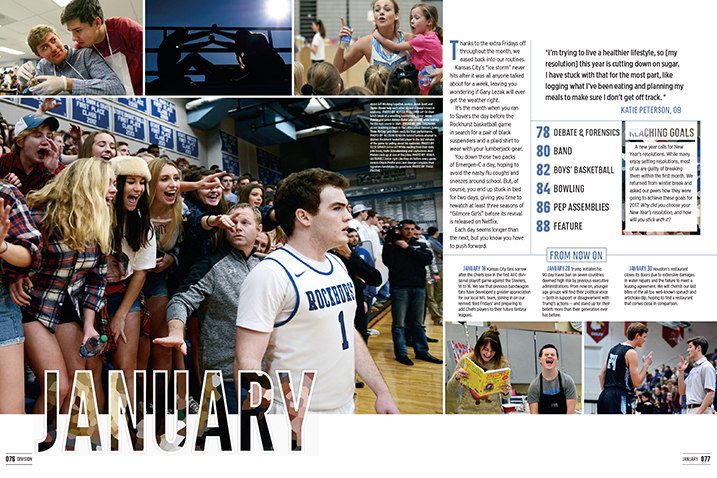 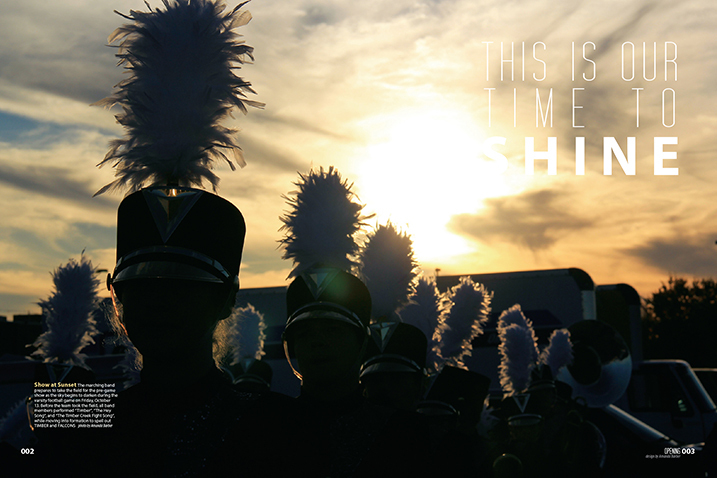 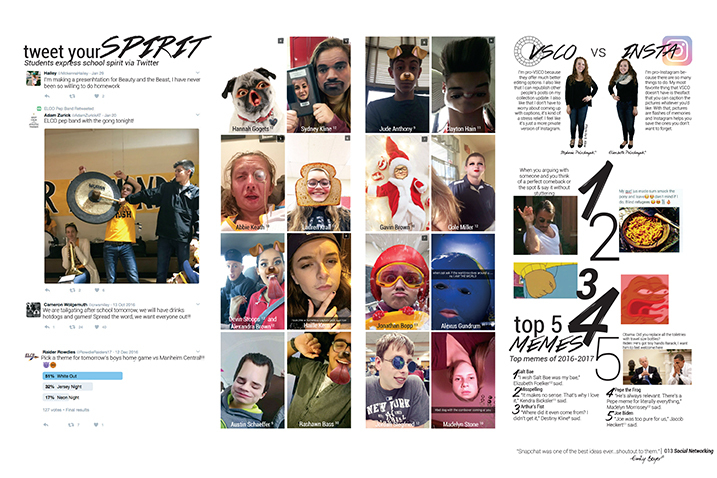 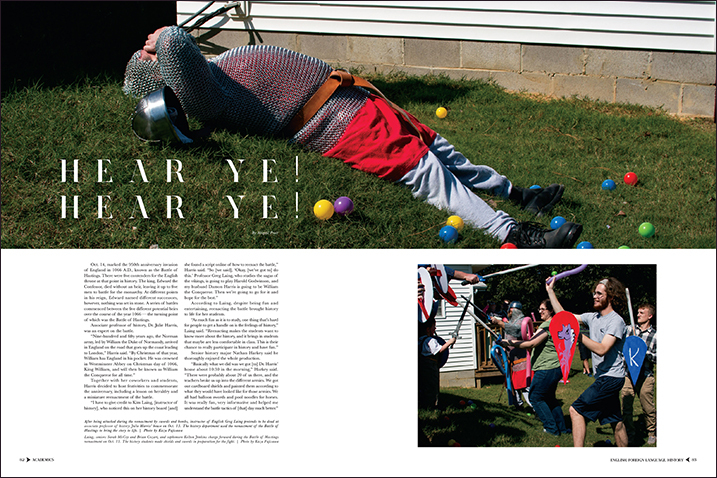 These staffs used their themes to tell the unique story of their year, from the cover to the closing. 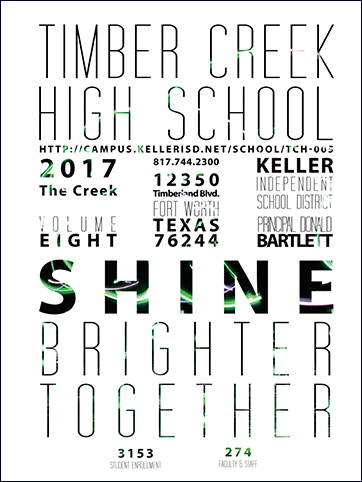 The Timber Creek staff chose a unifying theme for the 2017 edition of The Creek. 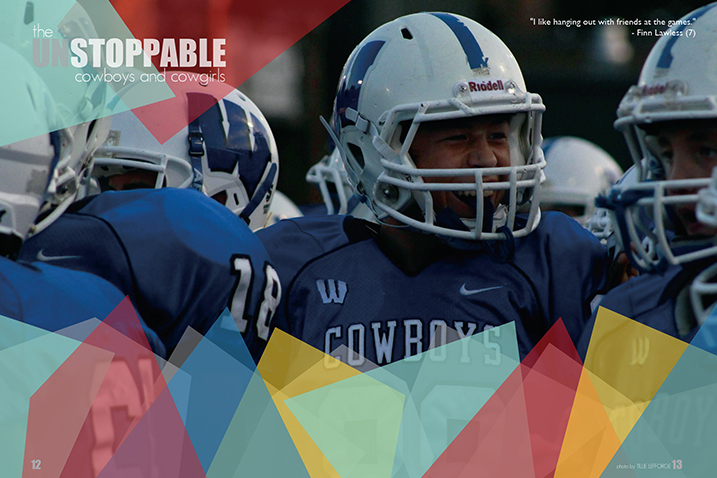 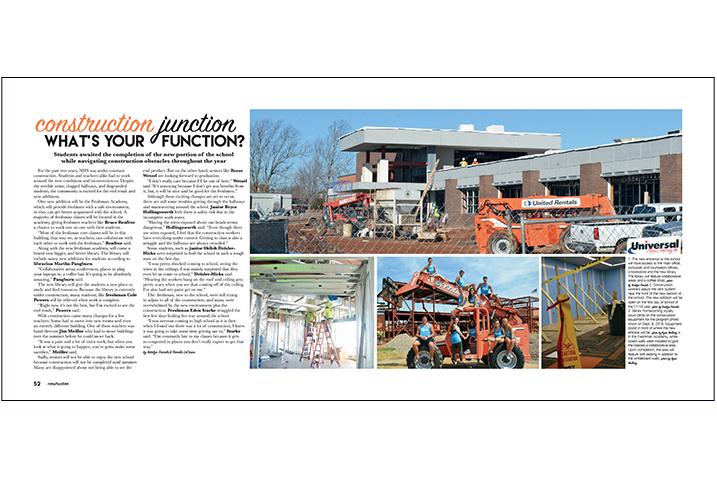 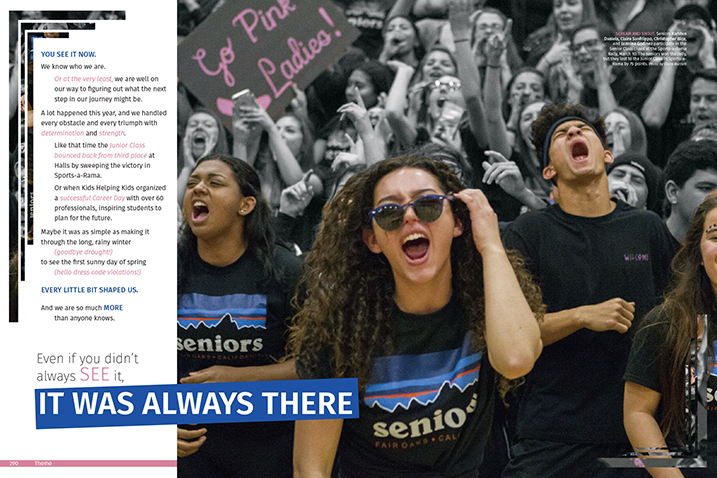 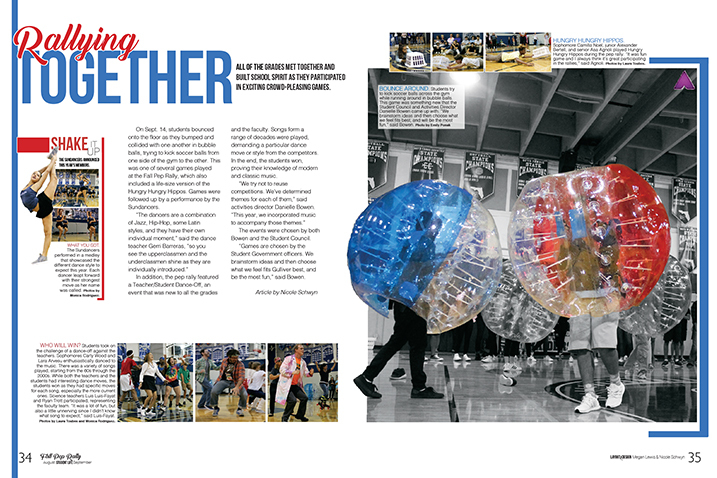 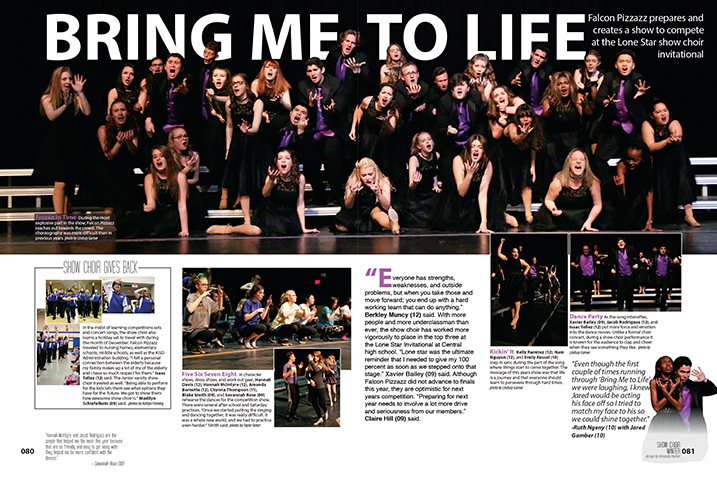 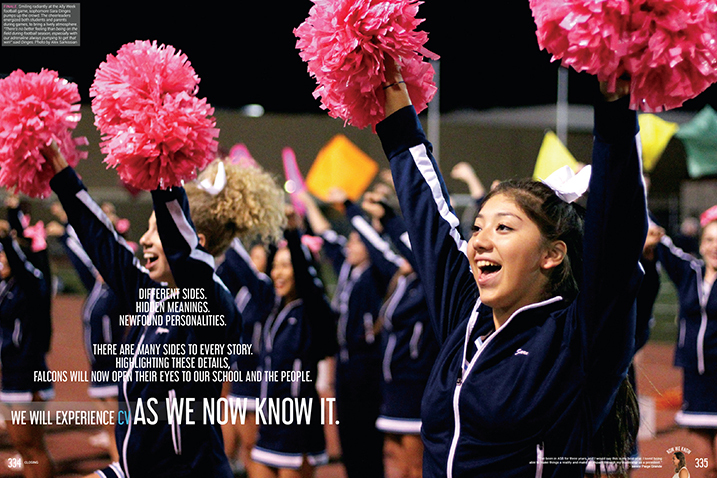 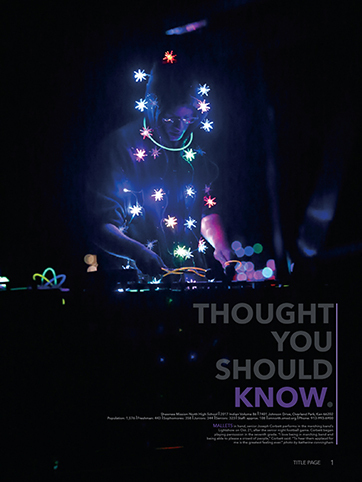 While Timber Creek is a huge school of more than 3,200 students, the editors wanted to convey the school’s family atmosphere and feeling of togetherness. 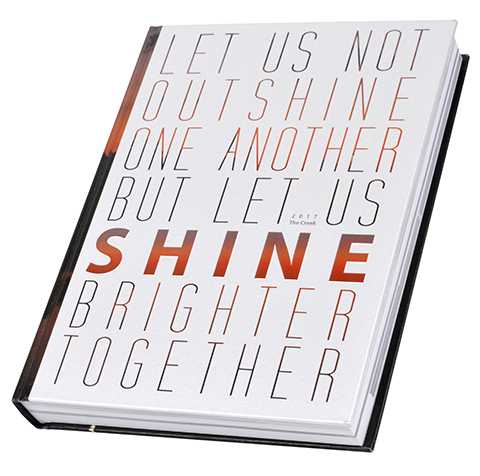 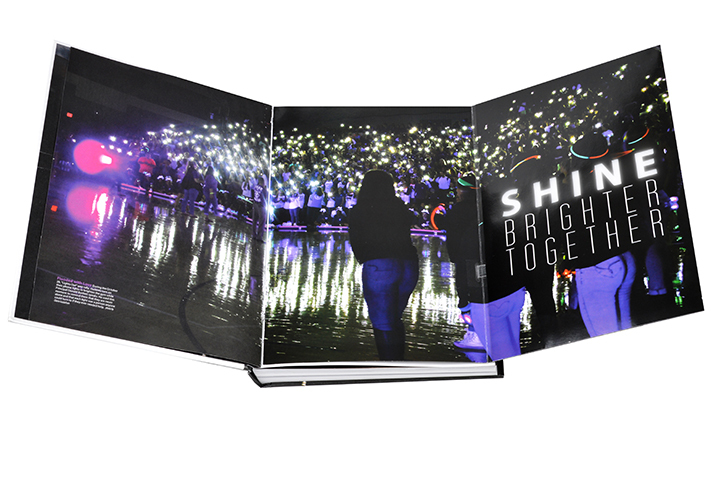 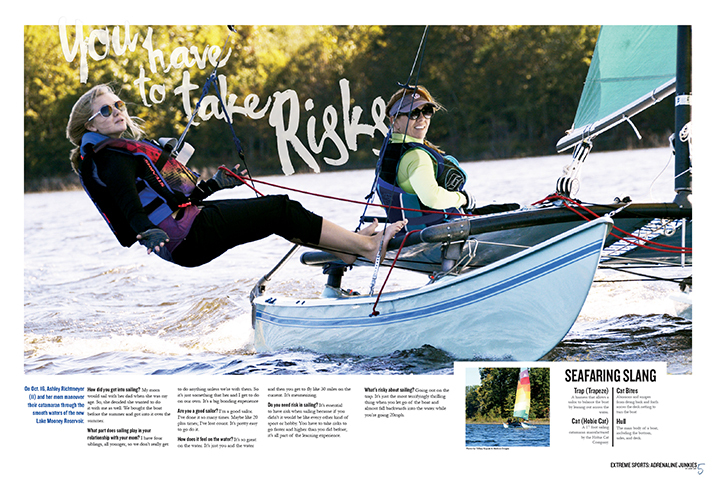 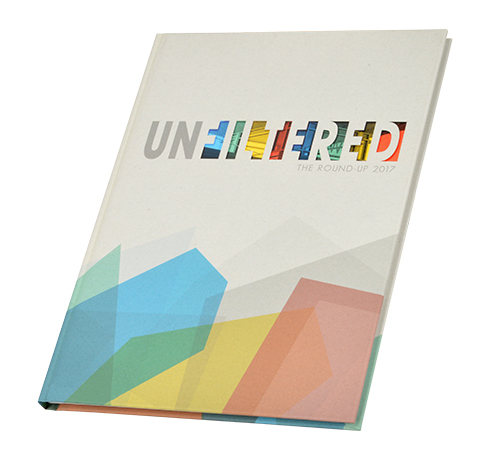 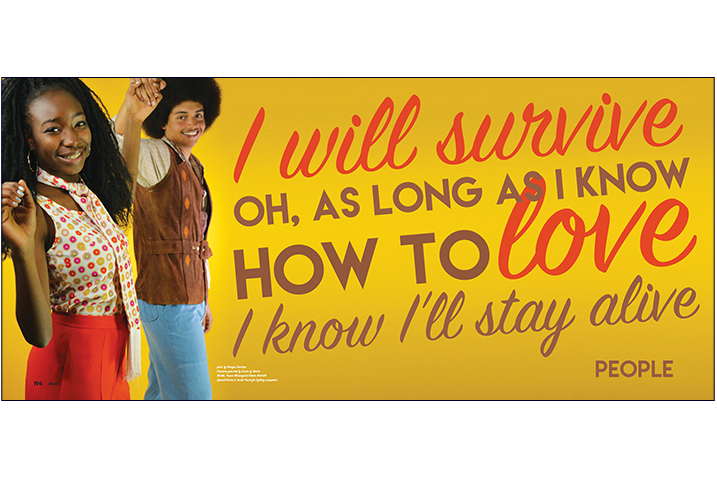 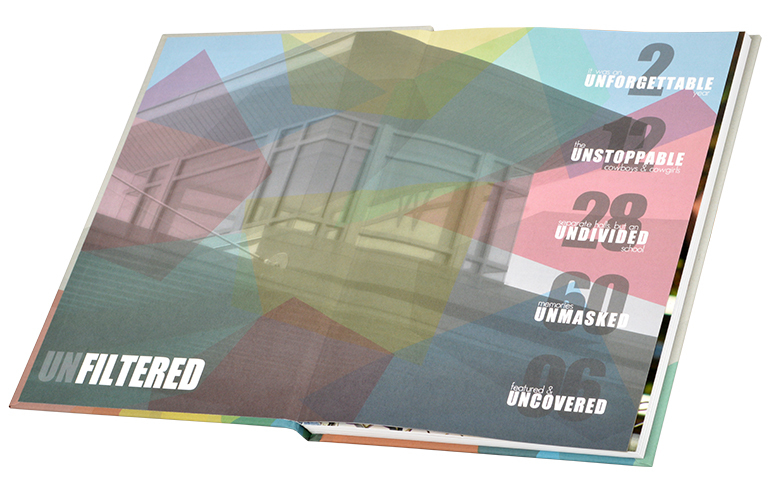 They chose a bold, ambitious way to demonstrate the theme with a tip-in foldout placed inside the front cover that included three LED lights and the theme phrase, “Shine Brighter Together.” Copy and imagery on the theme spreads, and in much of the coverage, all reinforces the book’s spirit of togetherness. 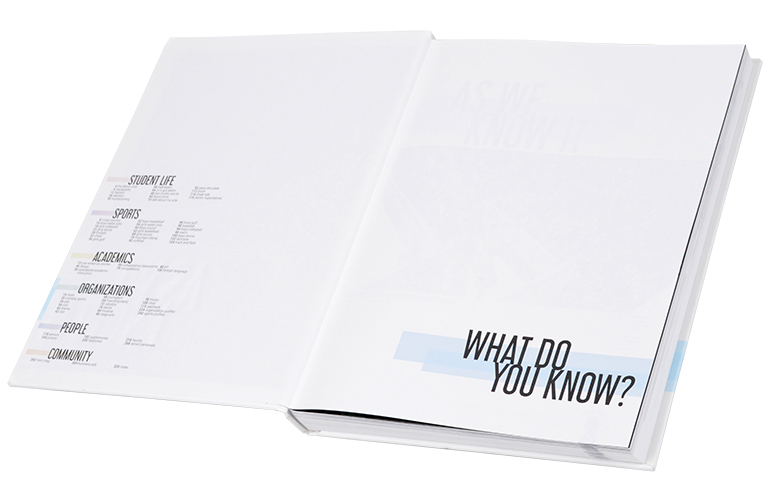 The visual of lights shining is presented beautifully on the front and back endsheets, in the fold-out and in the closing. 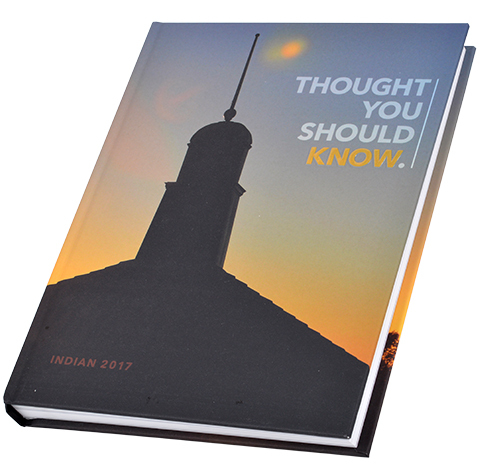 The Indian staff focused their coverage on telling readers the things they should know about the students at their school. 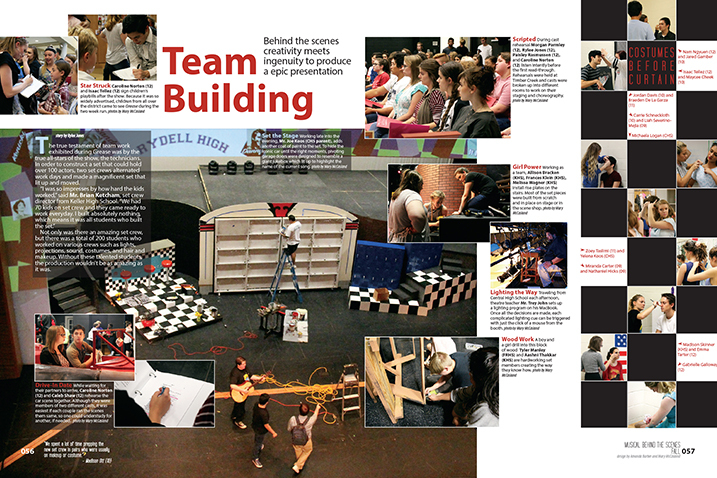 And they did that by letting the students tell their stories. 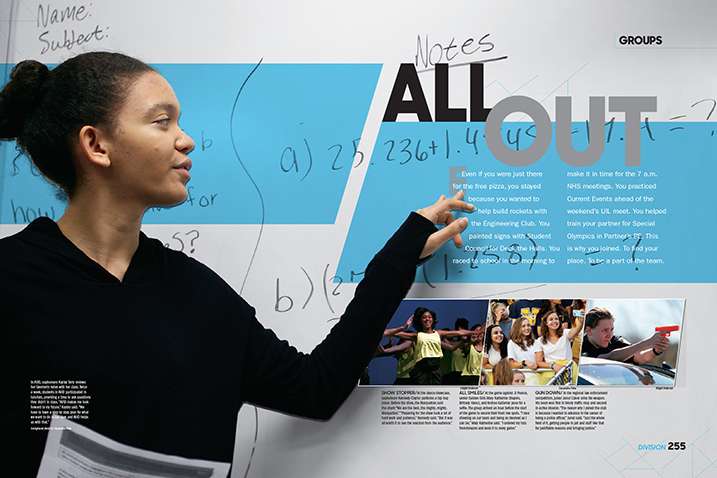 Quotes on the divider pages explain what students think others should know about them. 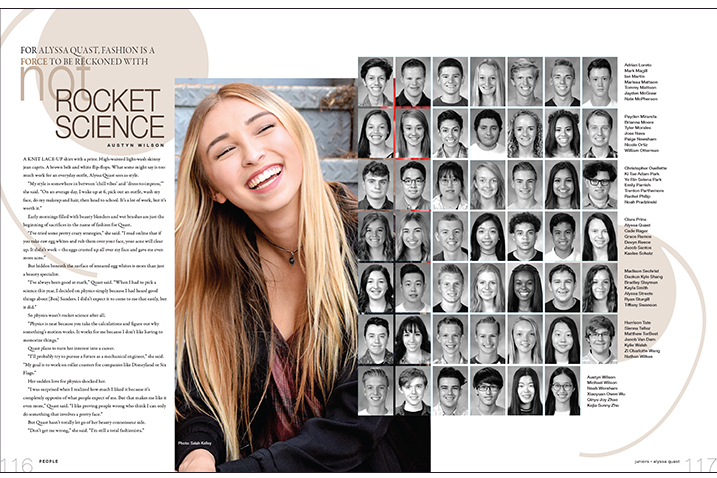 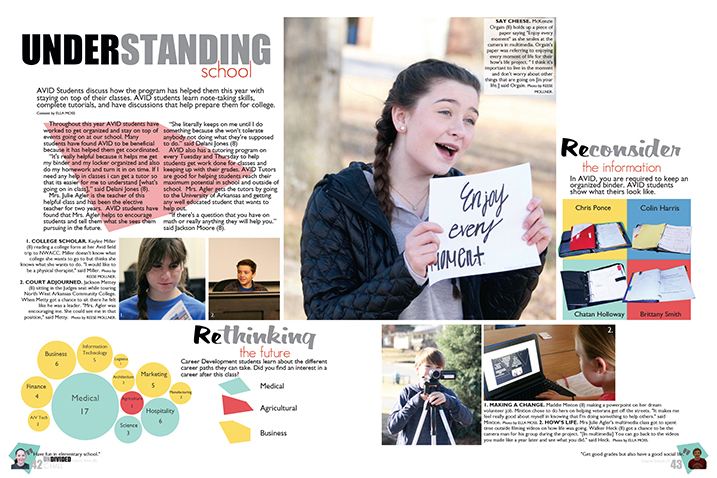 In addition to quotes in stories, captions and personal profiles, the group photo section, with 16 spreads, contains quotes from students and teachers that came from surveys seeking facts about them, school and life. 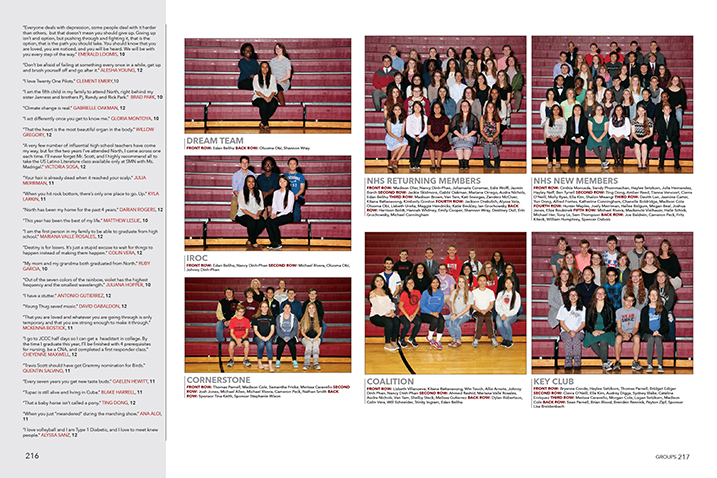 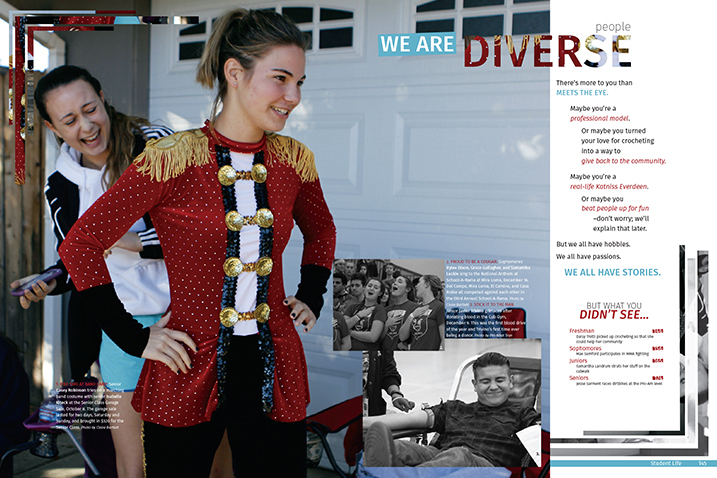 A muted color palette was used letting the staff highlight their school colors of black and red. 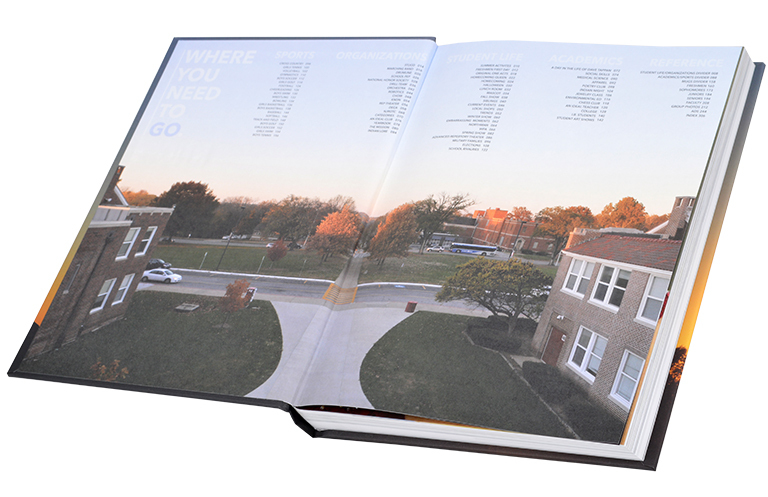 This book shows readers what it’s like to attend school at Shawnee Mission North. 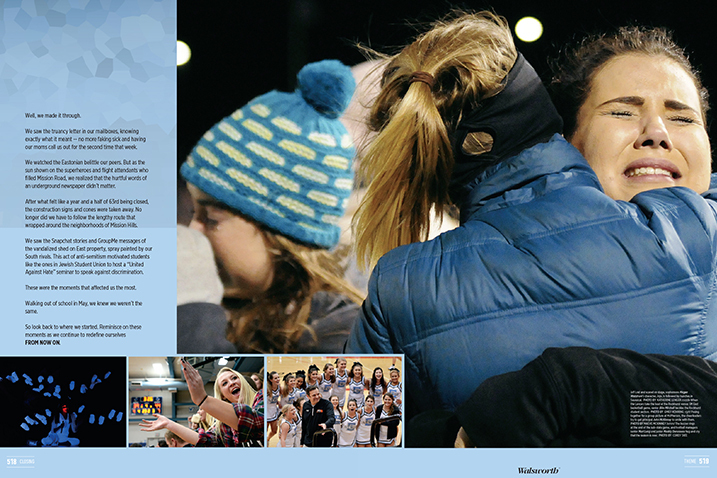 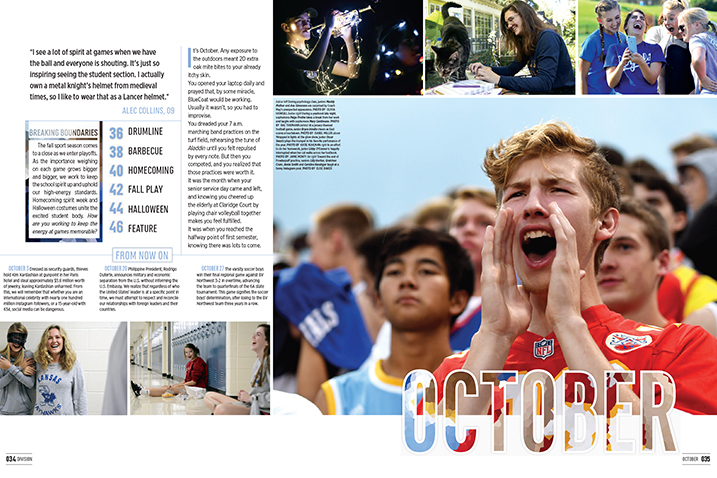 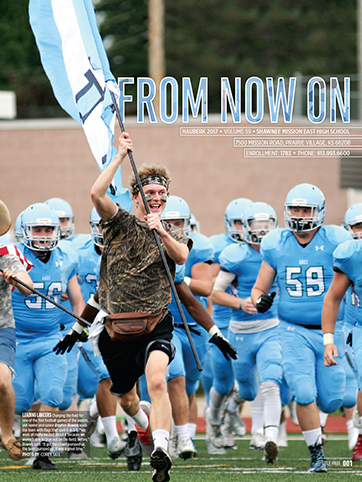 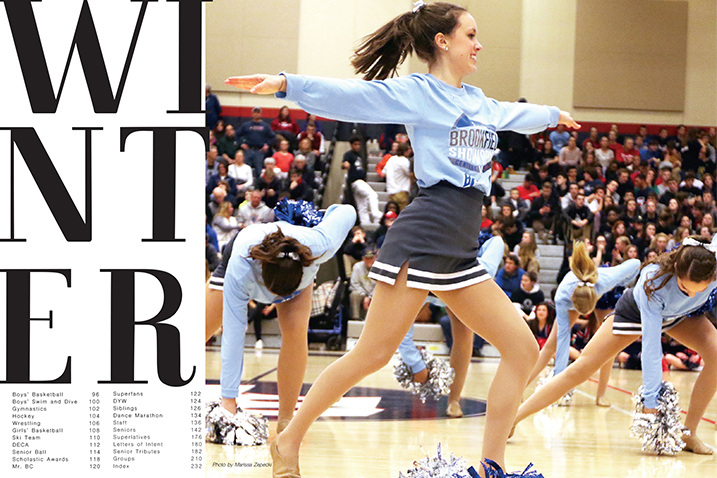 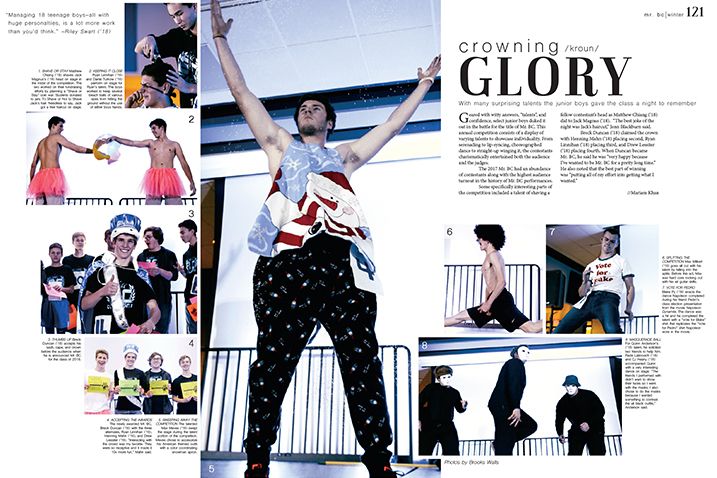 Editors of the 2017 Hauberk entered the year looking for a theme that emphasized school spirit and the impact each individual had on Shawnee Mission East. 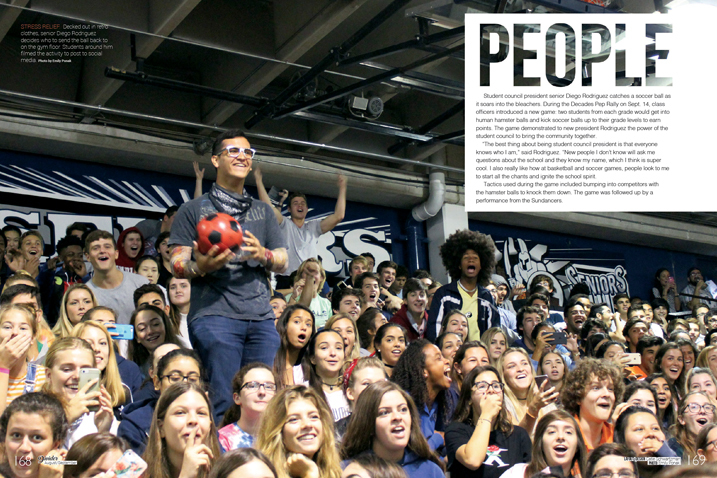 But as the editors documented in their colophon, shortly into the start of the school year their theme plans (and the entire school) were rocked by a series of news events, including a sexual assault on campus. 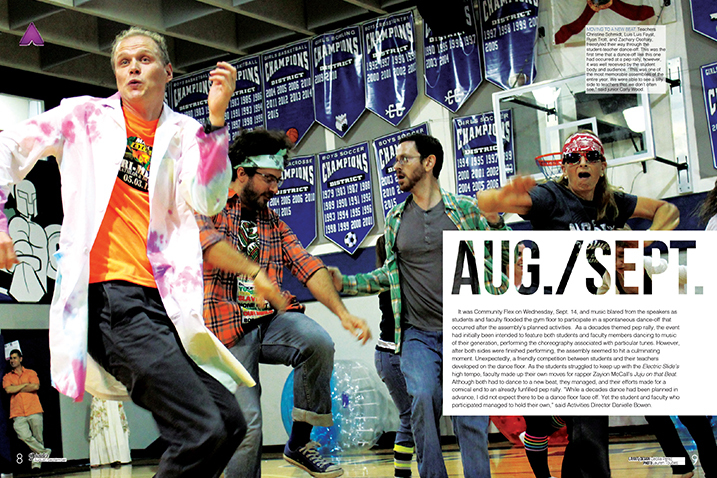 The staff wanted to keep with the spirit of their theme while addressing the events of the year. 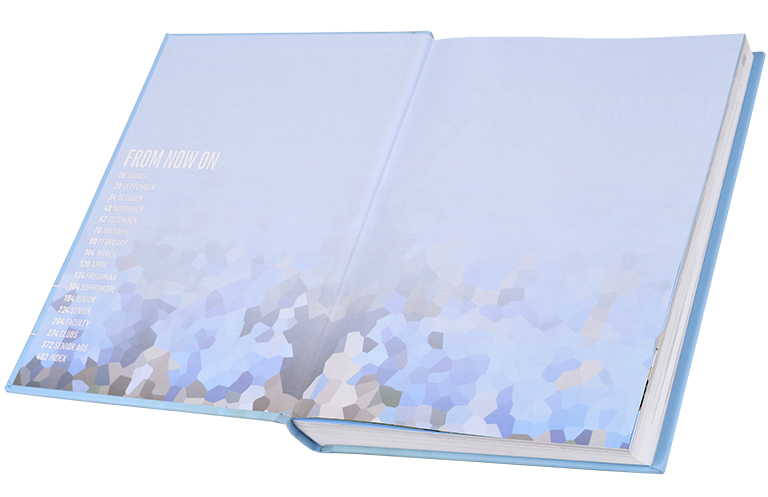 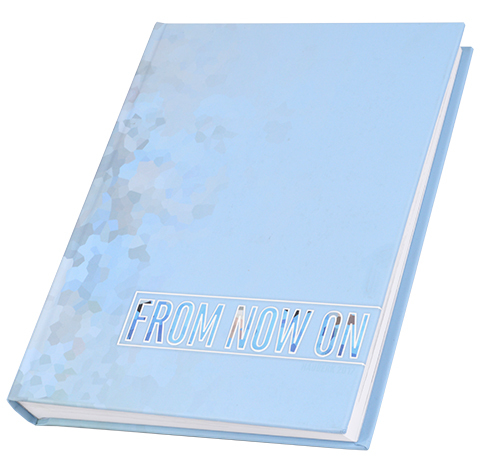 They “finally found three words that allowed us to show the impact of past events on our present as well as setting new expectations” with the phrase “From Now On.” East’s signature color of Columbia blue is found all over the book, tying together every inch. 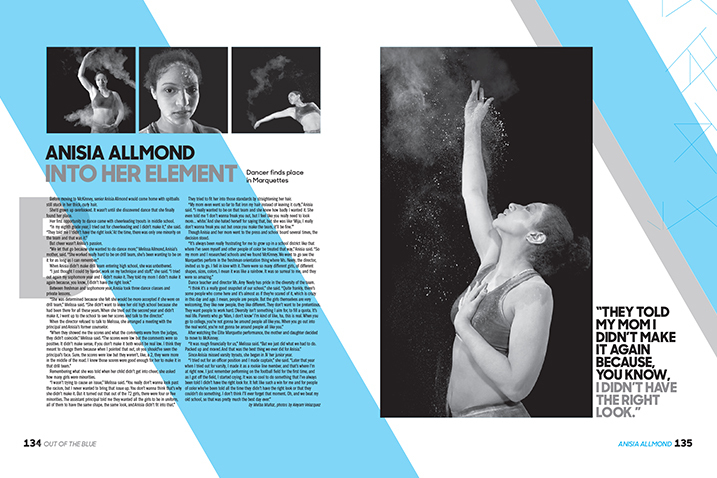 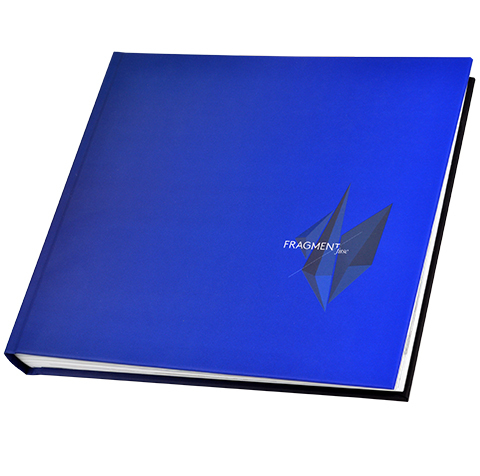 Also tying the book together are the theme element of crystals, which are introduced on the cover and can be seen in numerous headline treatments, representing several smaller elements coming together and creating a larger whole. 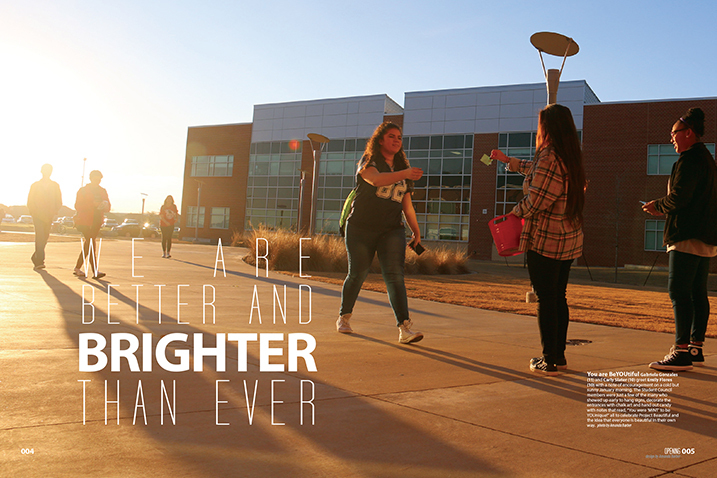 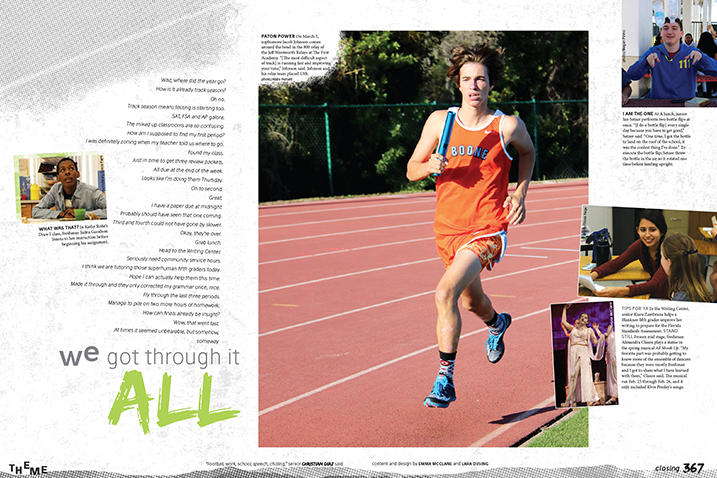 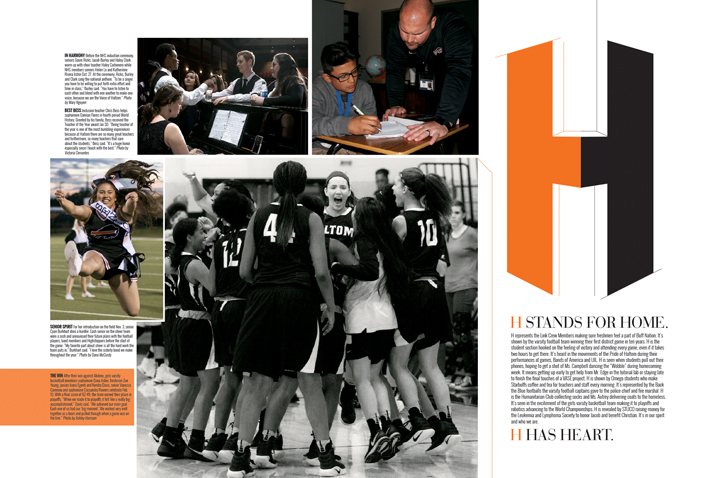 Haltom High School Principal David Hamilton announced the school’s motto for the 2017 school year would be “Haltom has heart,” and the yearbook staff ran with it. 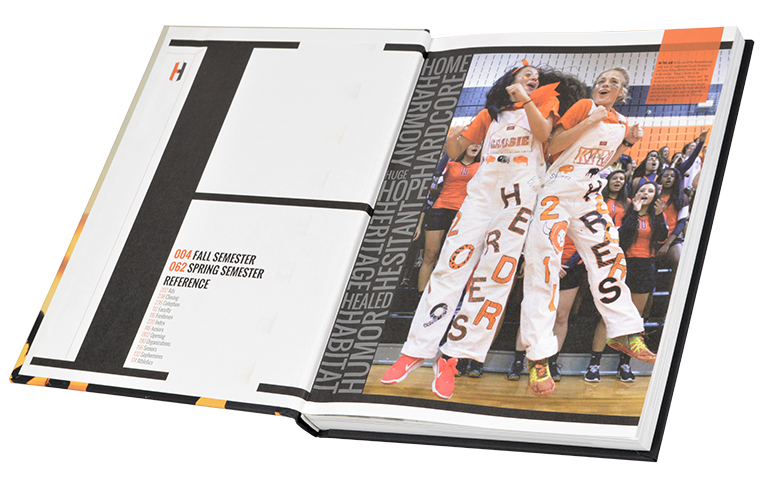 The staff chose a concept theme, using “H” to show the school and its students in a positive manner. 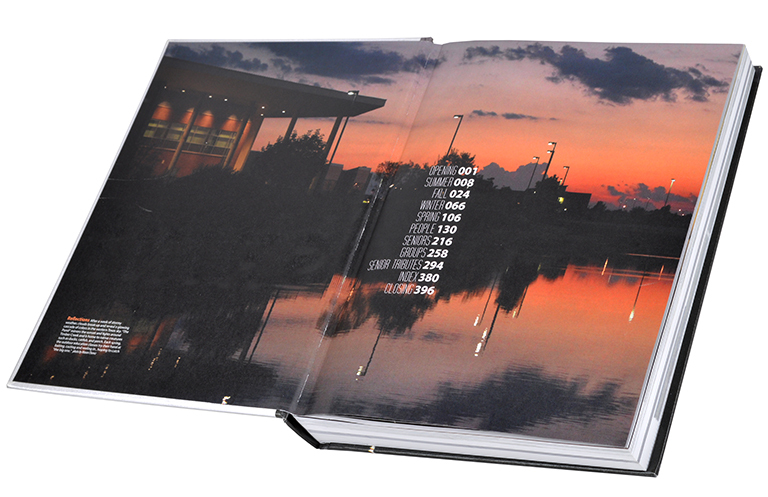 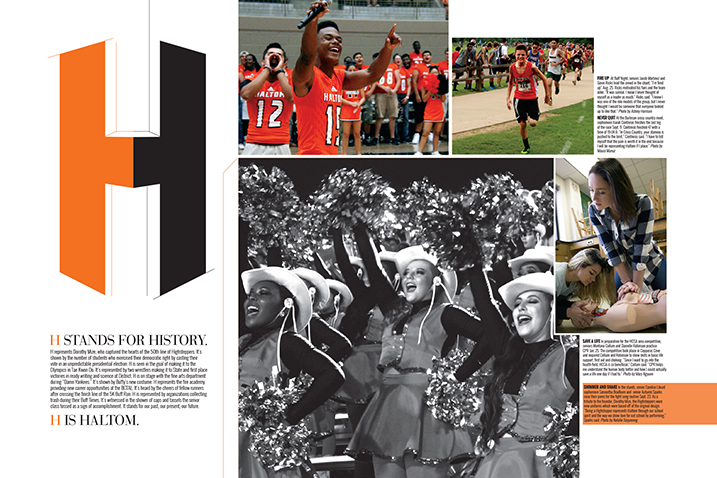 The split in the H, felt on the embossed cover and seen in the school’s orange and black colors throughout the book, represented the multiple sides of Haltom. 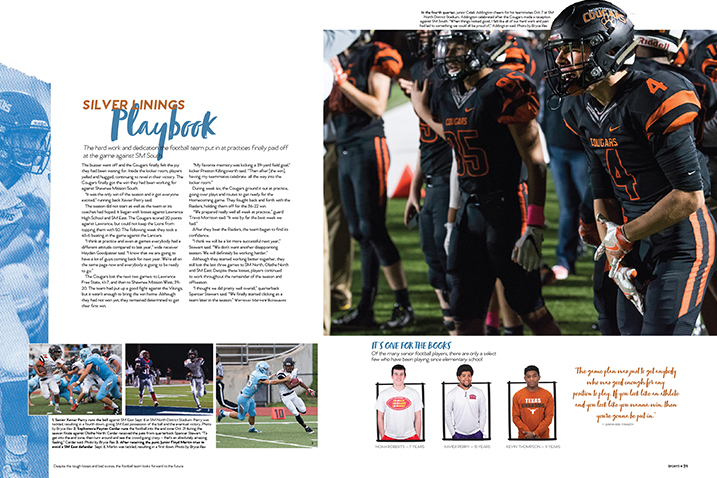 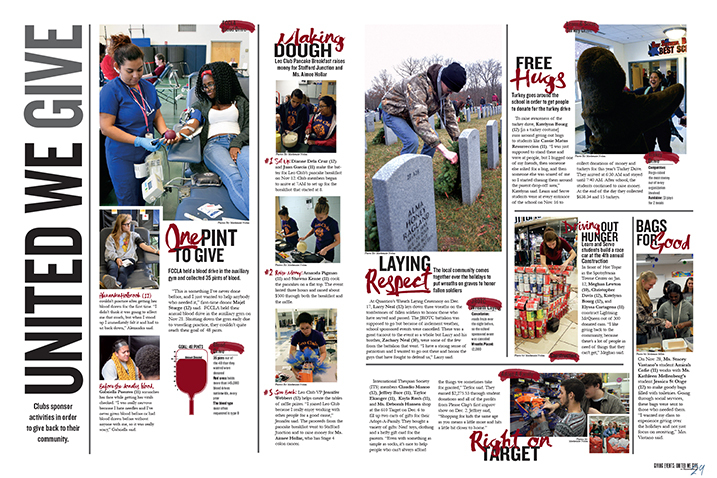 With that direction to guide coverage, the staff filled the book with photos, stories and graphics showing how Haltom was Home and how Haltom has Heart. 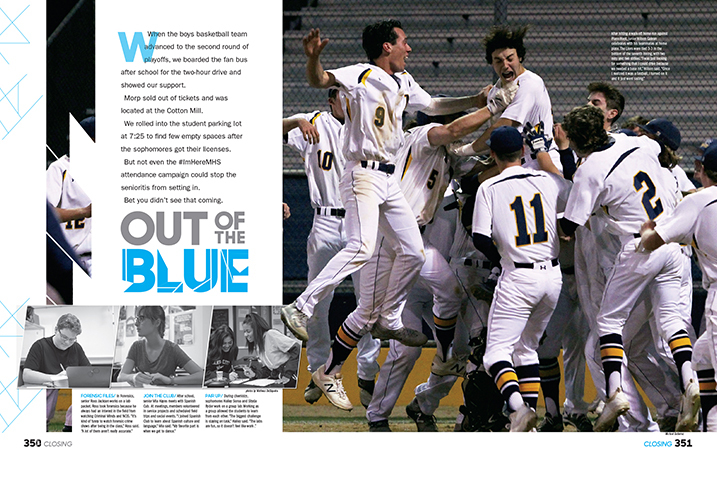 Theme: "Out of the Blue"
A school year is filled with unexpected moments that can happen out of nowhere, which is why the 2017 McKinney staff chose the theme “Out of the Blue” for the newest edition of The Lion. 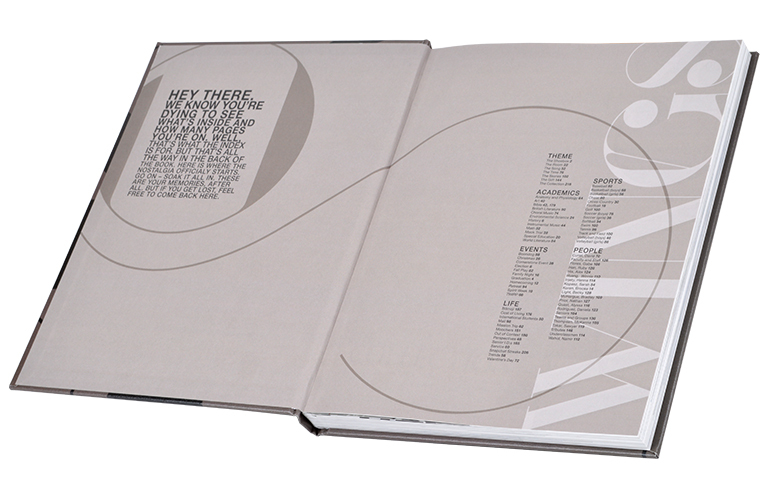 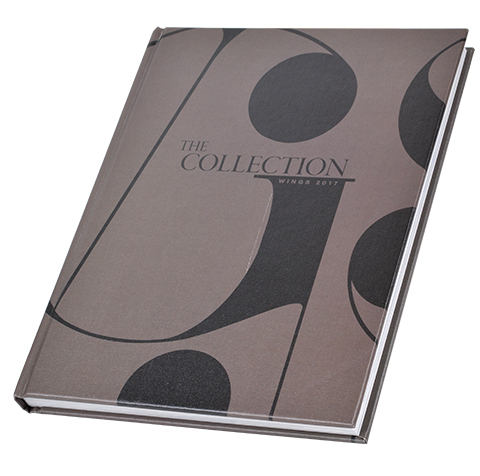 A simple, clean, modern design is used throughout the book. 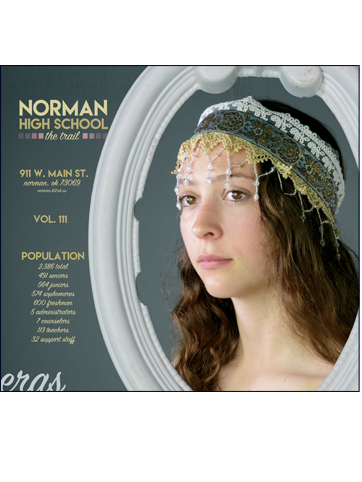 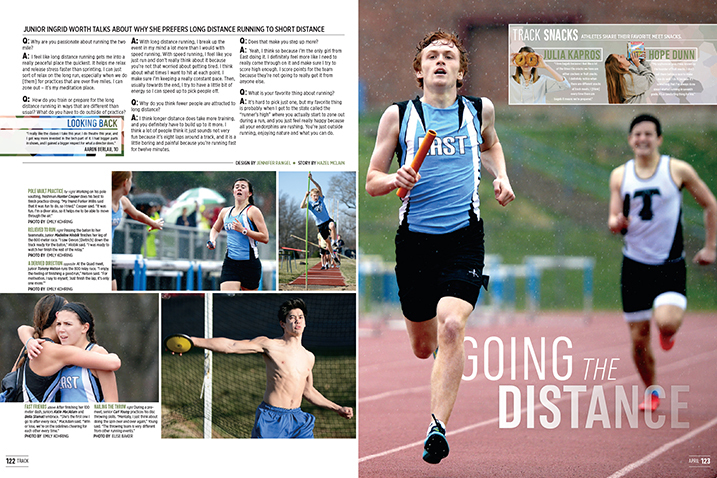 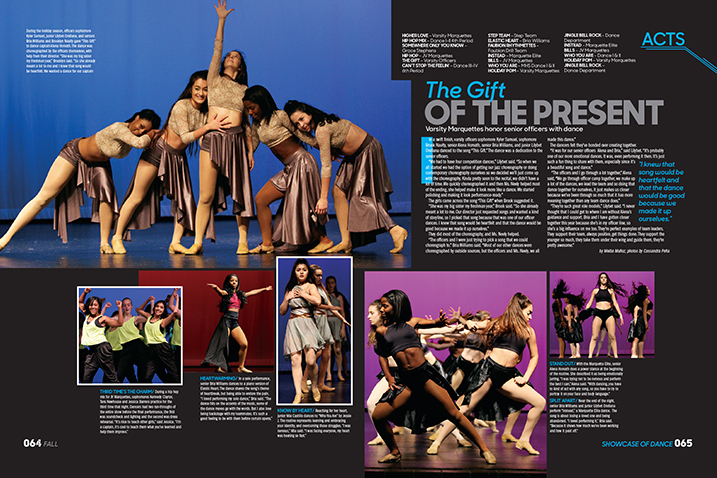 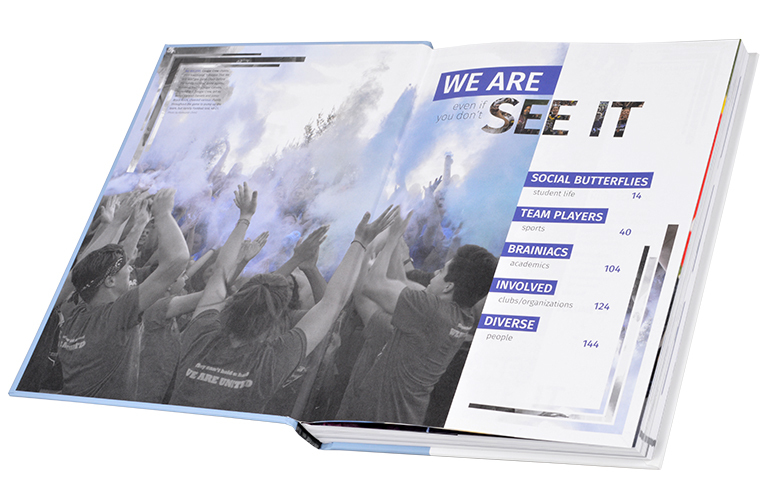 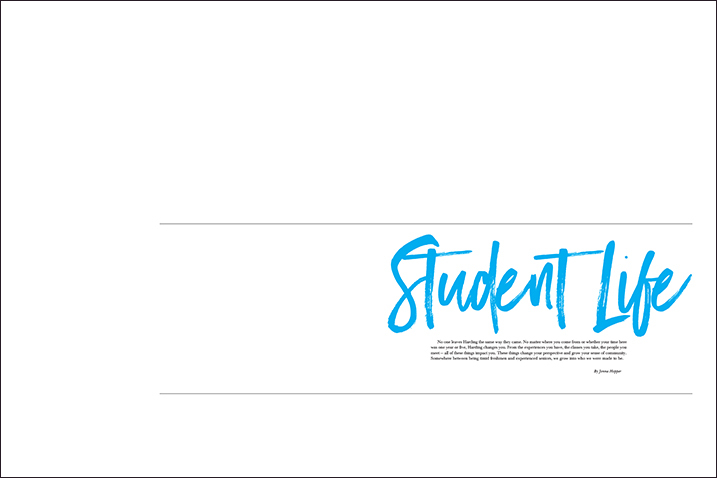 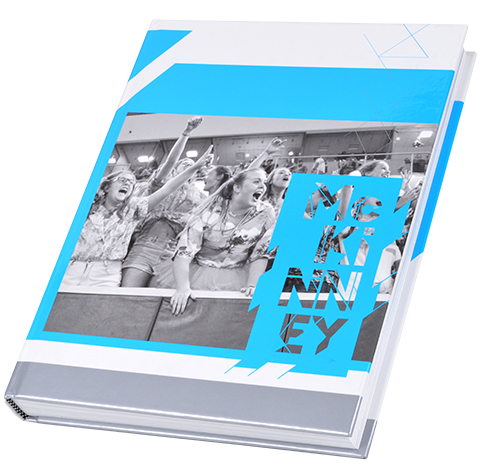 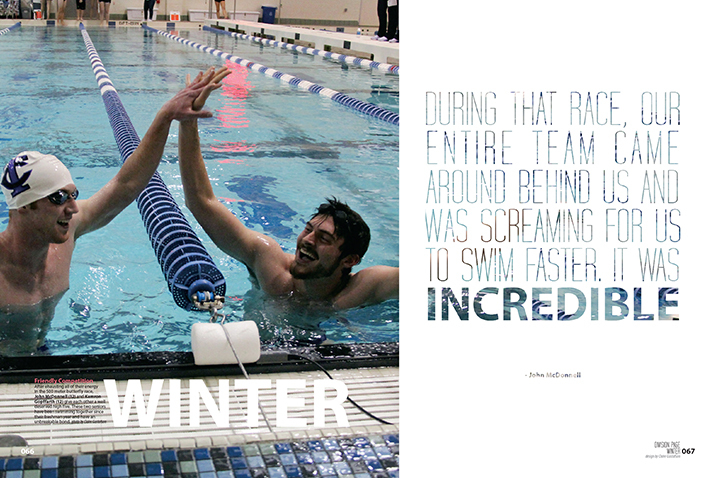 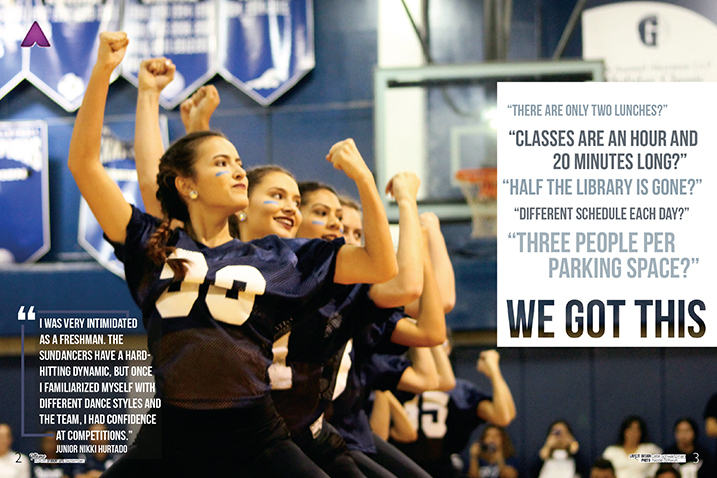 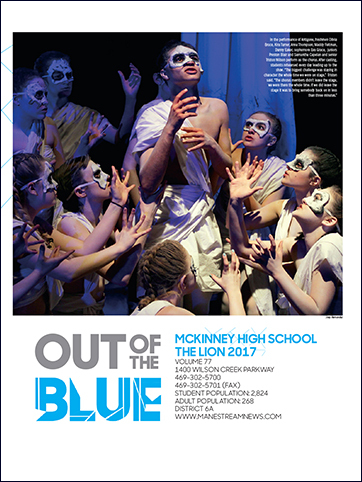 The editors explained in the colophon that pops of cyan blue were used as the main theme color, a slight deviation from the school’s traditional navy blue to “emphasize that this year was unlike any other.” One person was featured on each division page as an indication that all individuals at McKinney stood out. 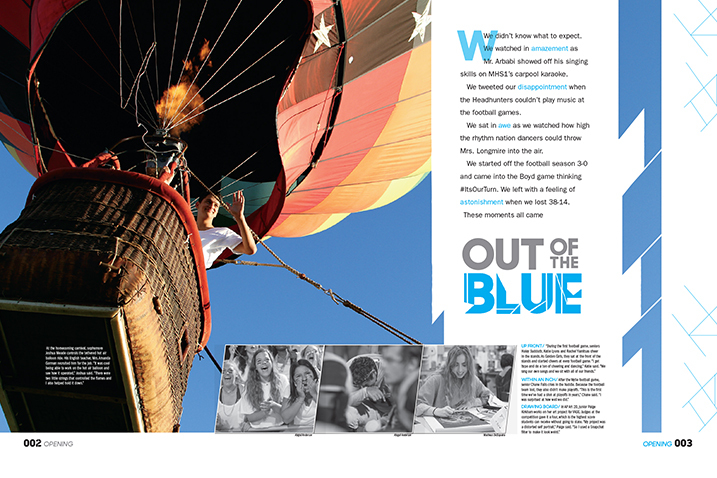 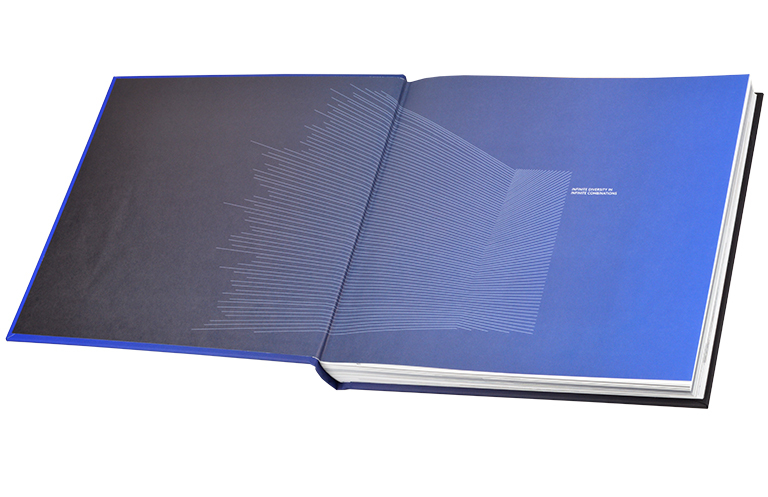 And a special theme section in the middle of the book featured “Out of the Blue” stories of students and staff. 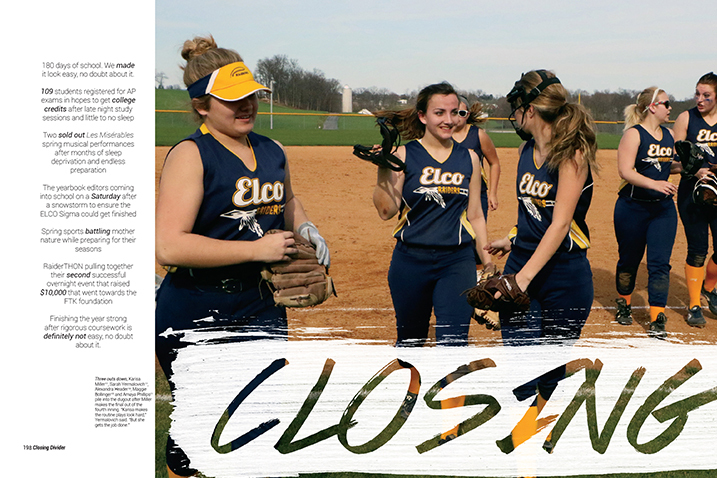 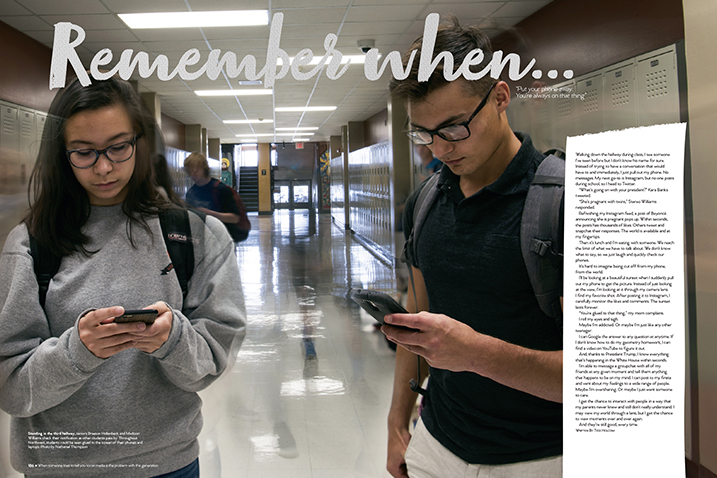 The 2017 Raider yearbook staff thought the uncertainty amid changes to the school routine in the fall should be the focus of the yearbook’s theme, but the theme words weren’t coming. 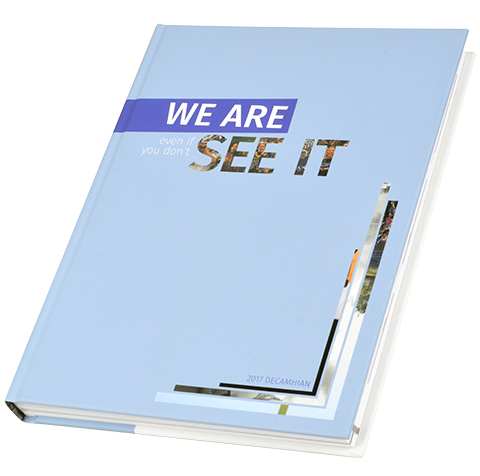 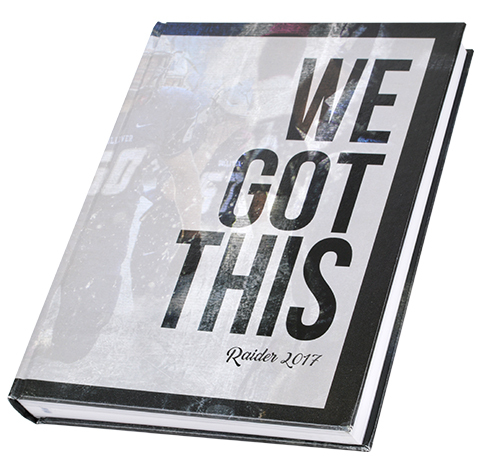 It wasn’t until September, when the staff looked through photos of what students had accomplished, that they were able to realize “we got this.” In this chronological book, the staff used tags and lines as design elements along with bold, thin and cursive fonts to give the book a sleek magazine look while “capturing the feel of high school in its sincerest form,” according to the colophon. 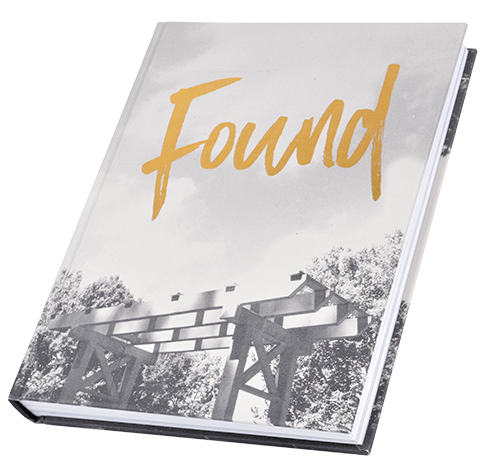 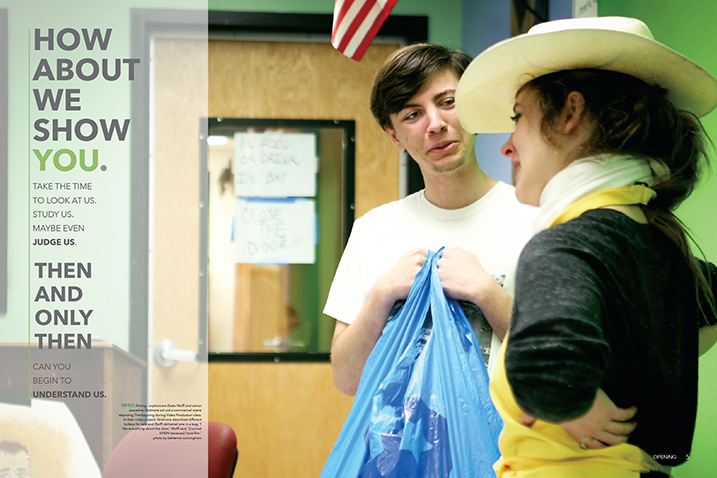 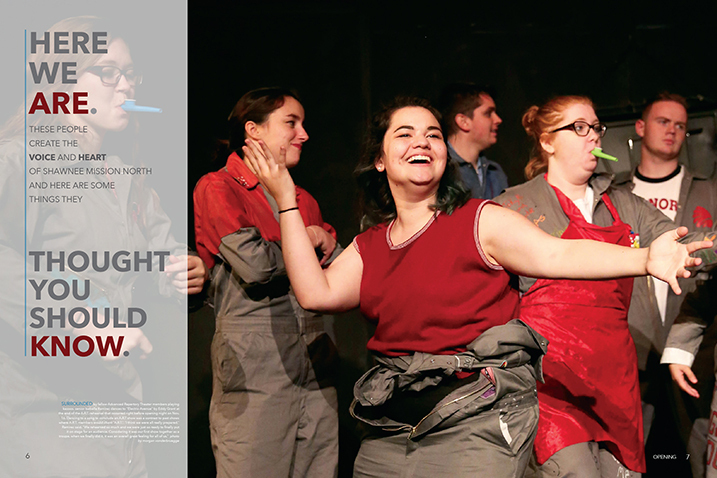 With the theme “Found,” the 2017 Petit Jean focused on the ways college years become formative for many students. 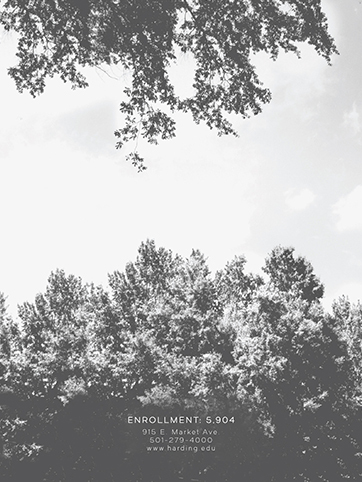 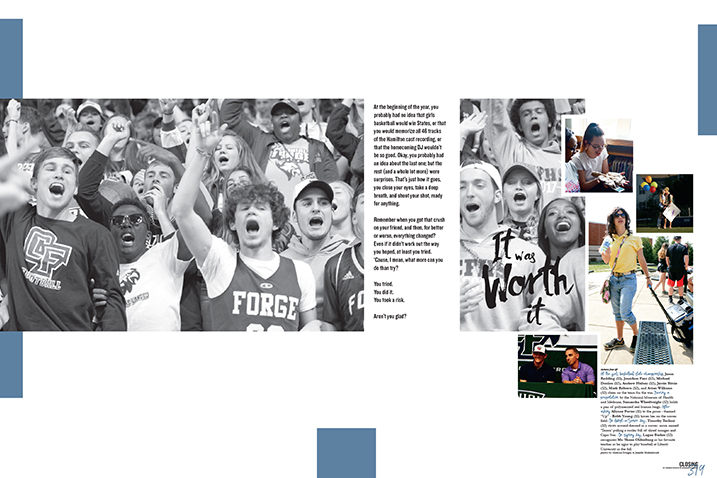 On the book’s opening spread, editor Kaleb Turner succinctly wrote that Harding students will revisit the 2017 Petit Jean years down the road, “open its cover and know this is where you found yourself – at our beloved Harding.” The theme phrase stands out on the cover in the font Black Diamond, and even more so on the book’s simple, clean division pages, which present the section titles on plain white spreads with interesting intro copy. 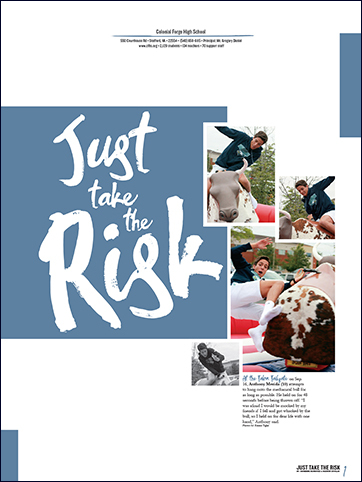 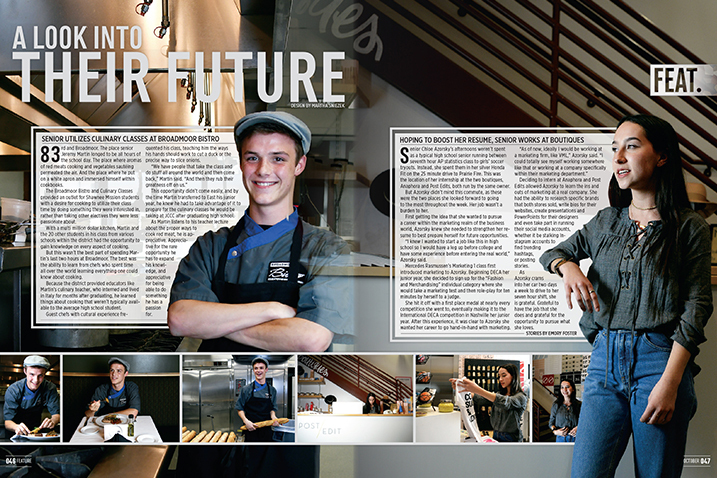 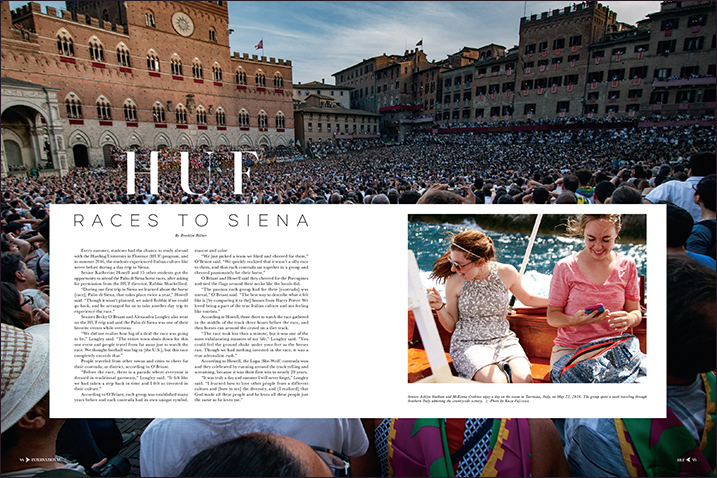 The coverage does a good job following the theme, with stories of Harding students experiencing life studying abroad and pursuing unique interests. 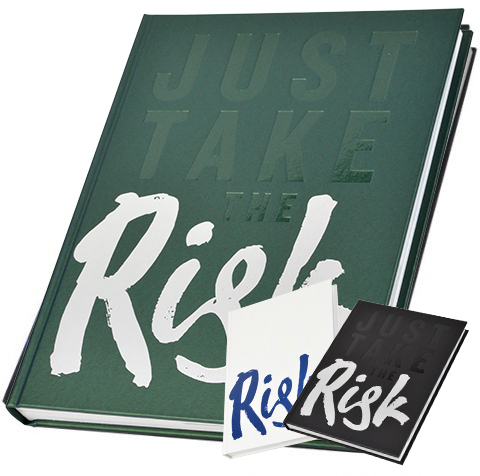 Theme: "Just Take the Risk"
Sometimes you have to just take the risk. 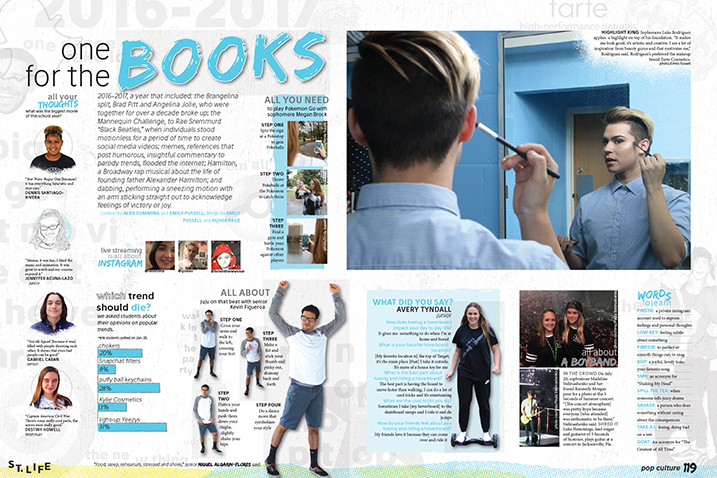 That’s what the 2017 Apollo staff did in deciding to create three covers of their book that use the school’s three colors of navy blue, forest green and silver in either the cover color or the hot foil or silkscreen color. 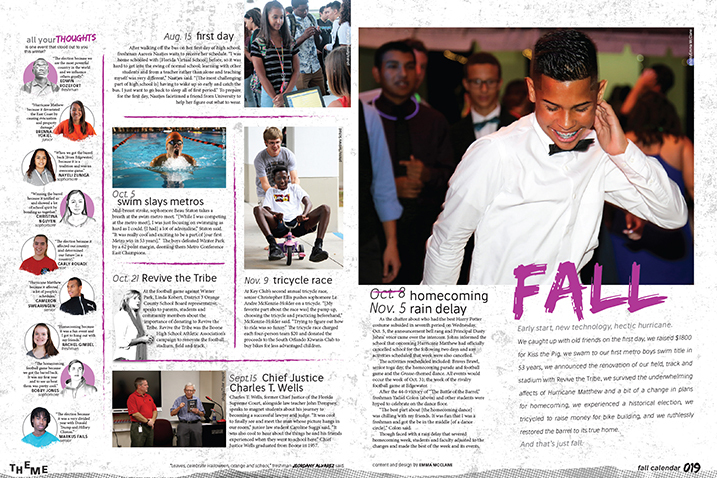 From there, coverage focused on the choices students made during the year, from raising a hand in class to cliff jumping. 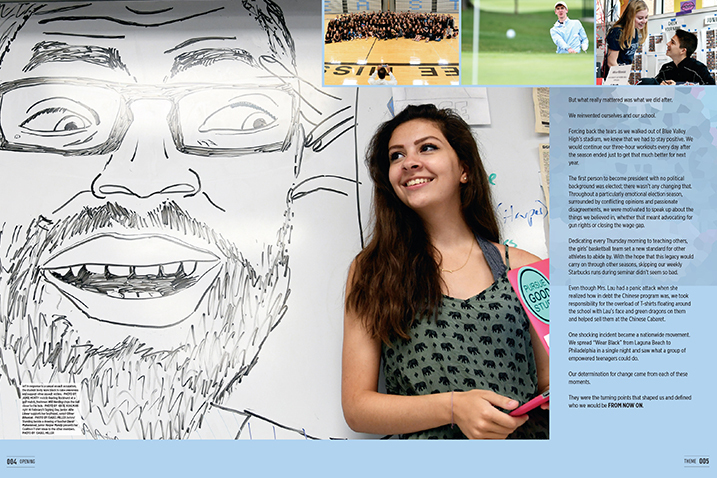 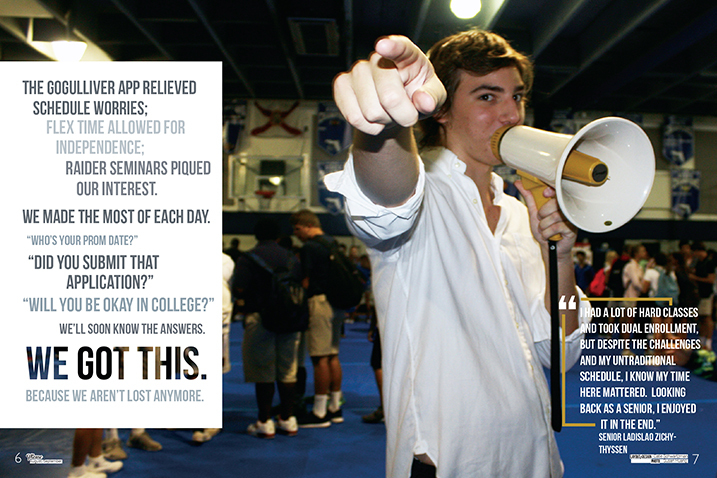 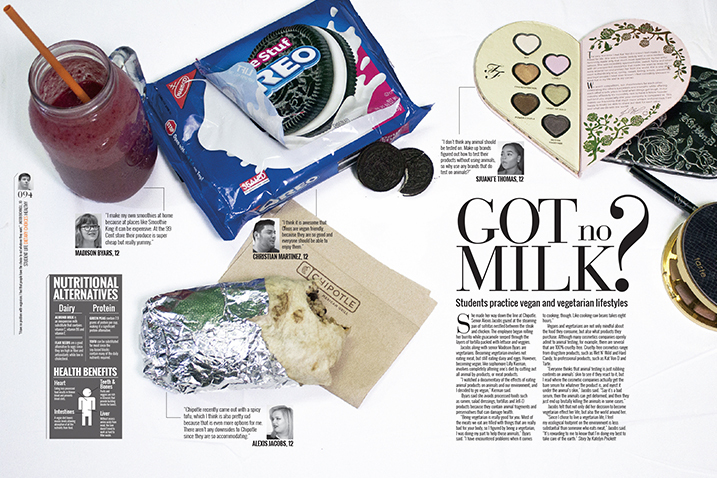 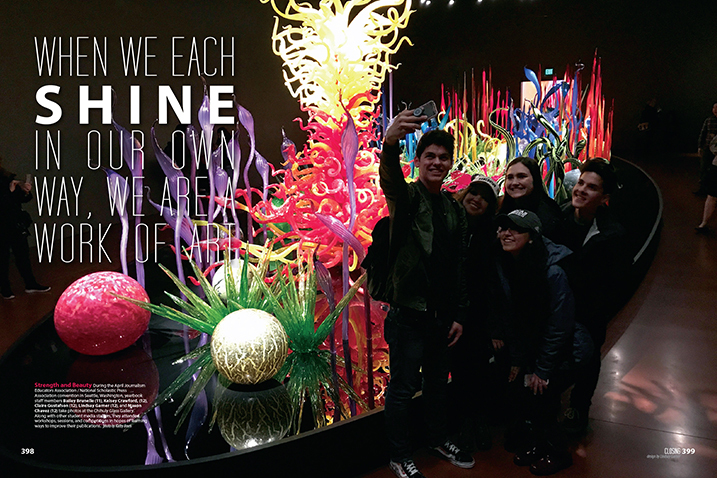 First-person accounts in captions and stories show how students tried new things. 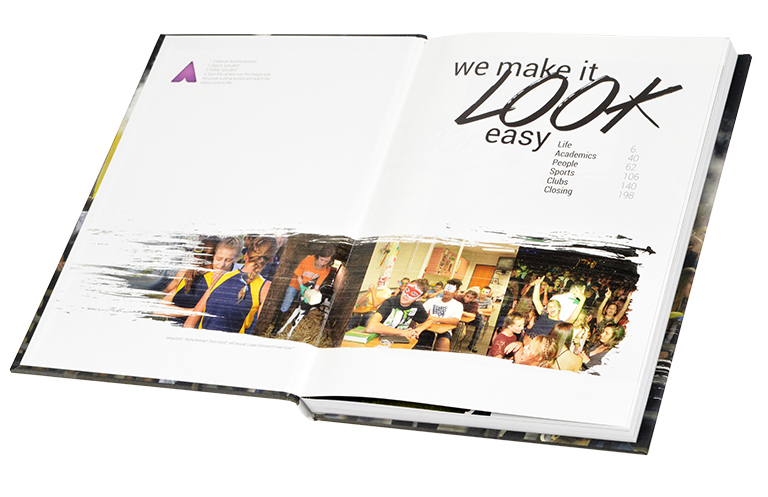 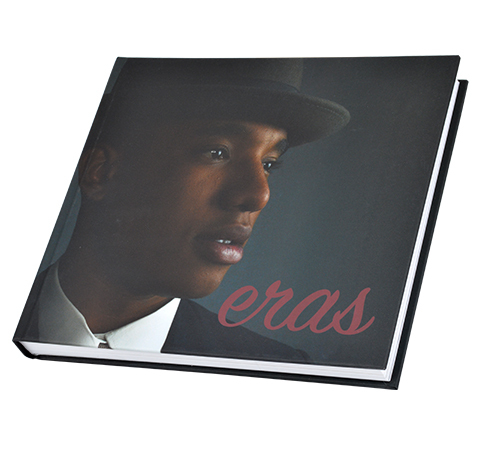 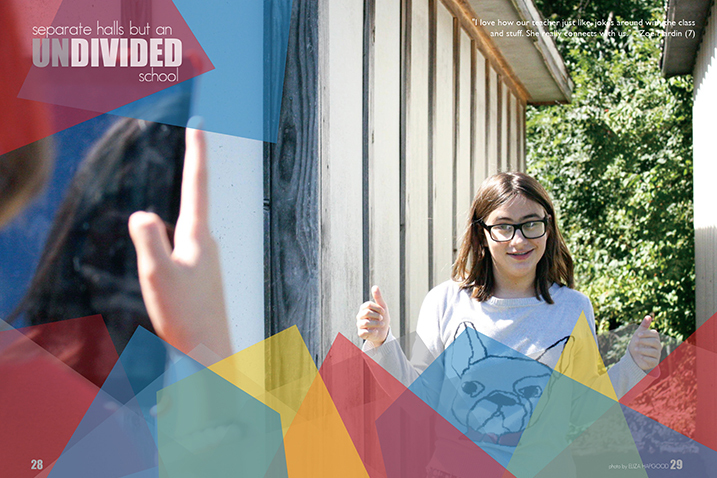 This book also sets the standard for outstanding photography in capturing students throughout the year. 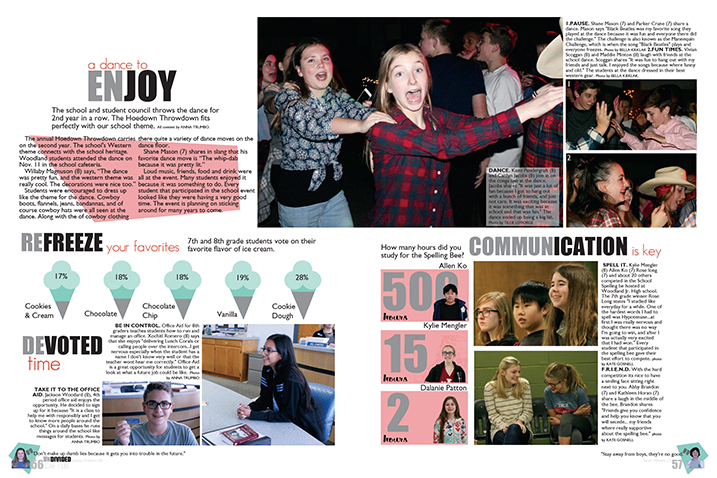 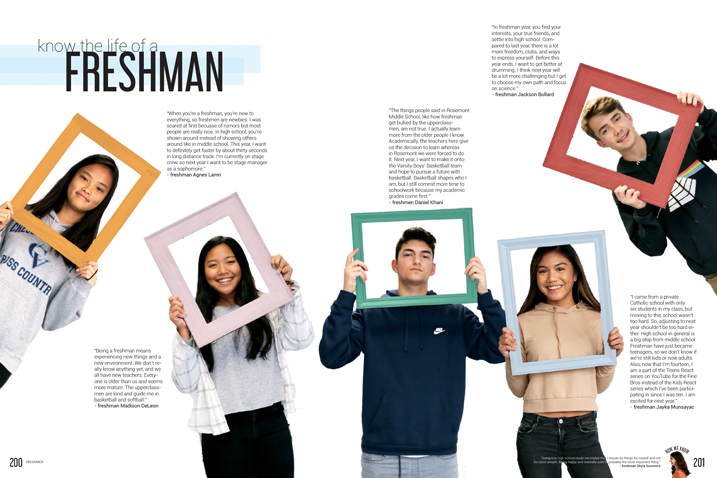 With their theme, the 2017 Decamhian staff asked readers to ditch all the usual teen stereotypes when looking back at Del Campo students and the school year they experienced in 2016-17. 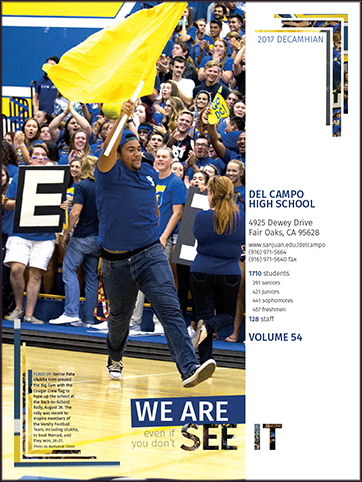 Sure, they procrastinate on homework sometimes and they love nothing more than hanging out with friends, but as the opening copy declares, “there are a million more things that you don’t see” and “to make it simple, we are pretty complex.” Division pages that introduce each section of the book include a “We Are” headline that declares another characteristic of the Del Campo student community. 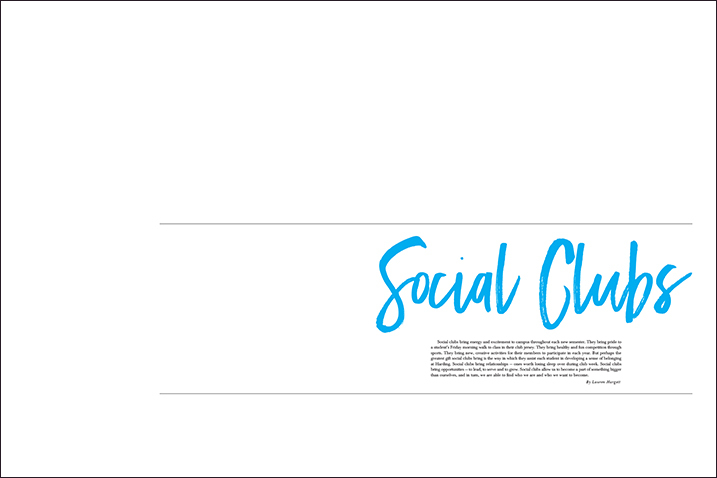 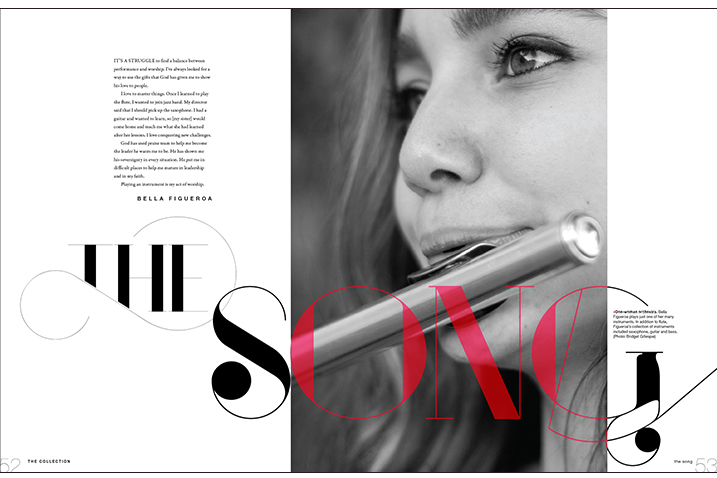 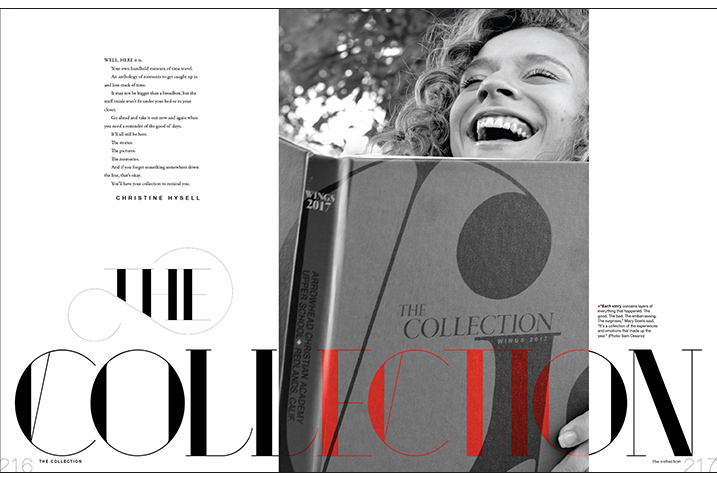 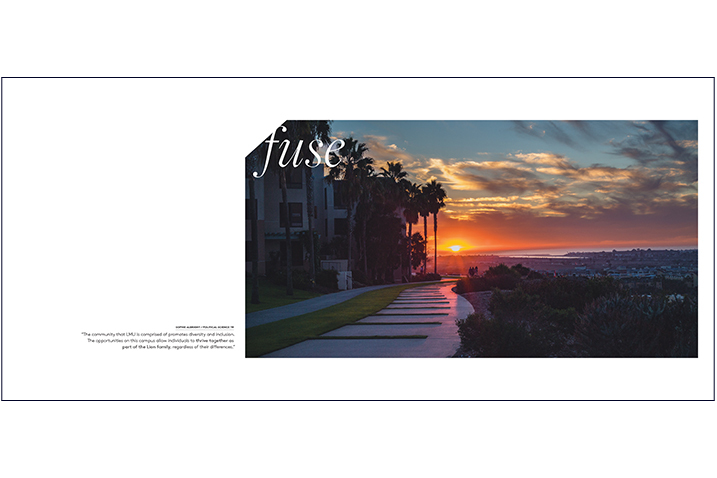 Design touches used consistently to carry the theme through the book include three bars with slivers of images in the corner of the page and portions of images inside headline text. 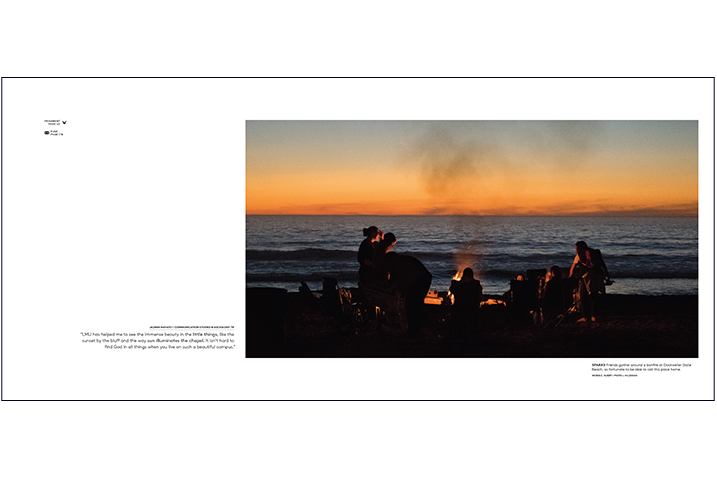 Concept themes aren't easy to pull off. 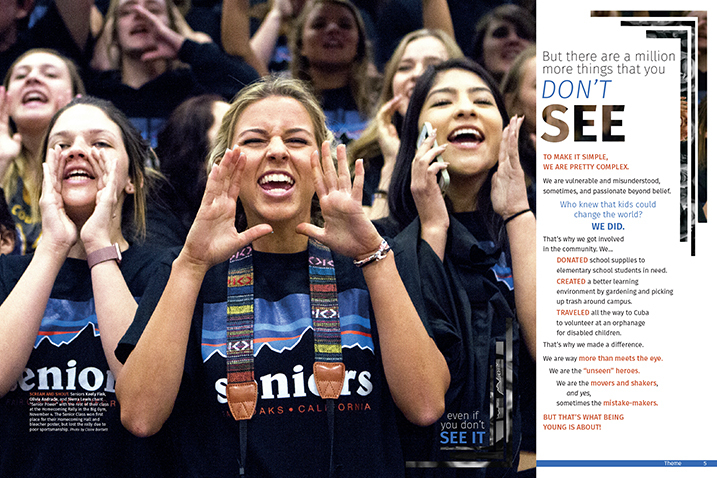 They’re certainly not for yearbook staffs that are faint of heart. 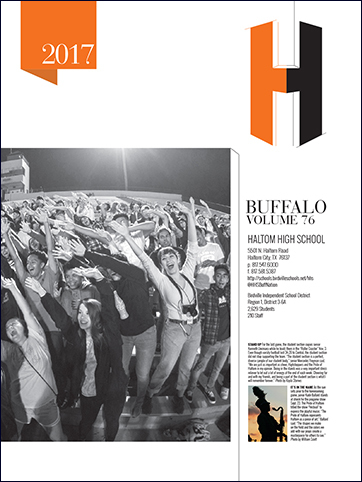 The Norman staff wasn’t afraid to get creative and go for it with the 2017 edition of The Trail, a square shape to highlight this as a unique book. 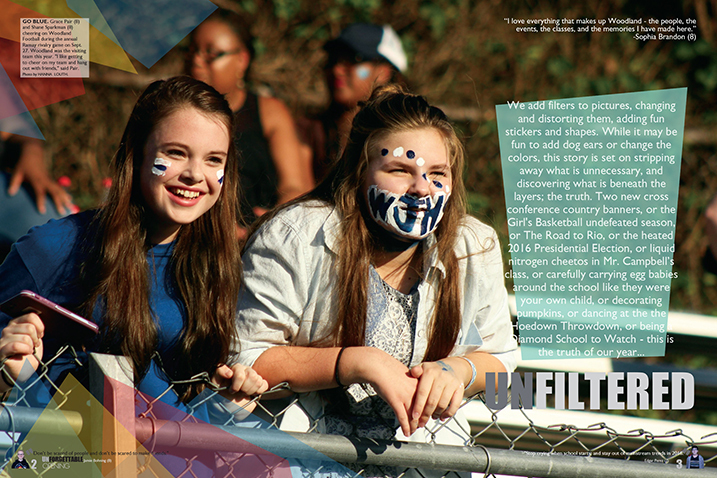 The idea – their school was founded in 1891 and the theme “Eras” was a look back at previous generations and how the school “has changed and grown into a school of spirit and acceptance.” To throw themselves fully into the concept, opening and division spreads show students cosplaying from different historical “Eras.” The book also includes plenty of coverage of the current year, including chronicling the school-wide construction that launched the newest “era” at Norman High. 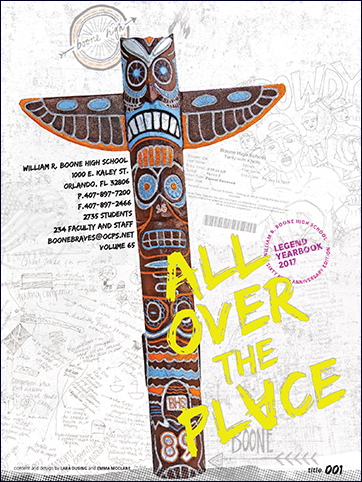 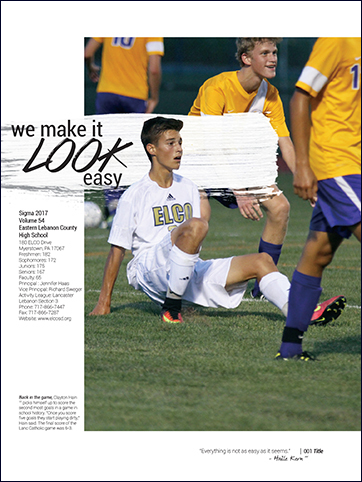 Theme: "All Over the Place"
Boone students don’t just go to school and go home – they are busy, according to the editors in the colophon. 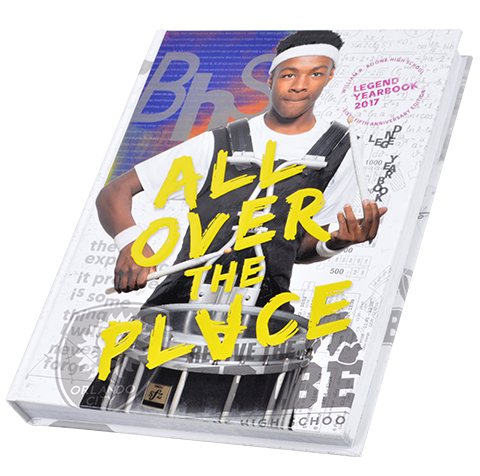 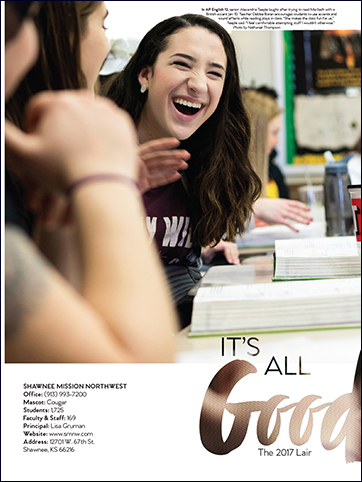 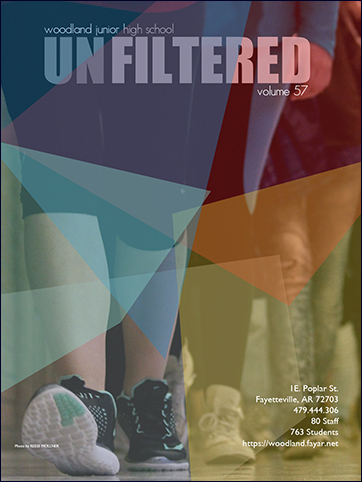 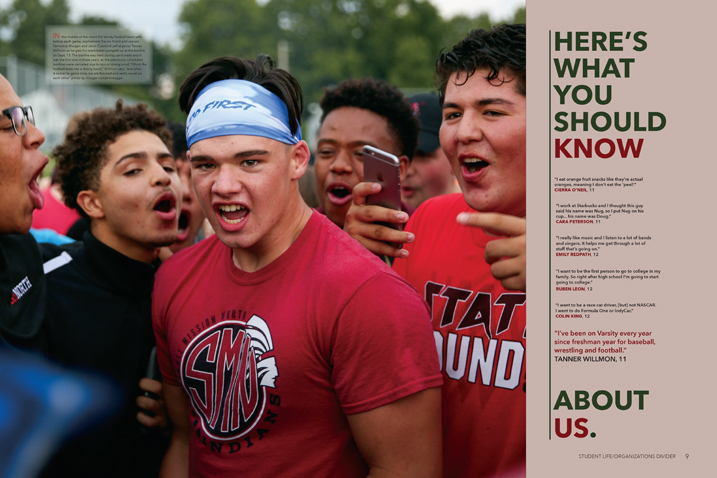 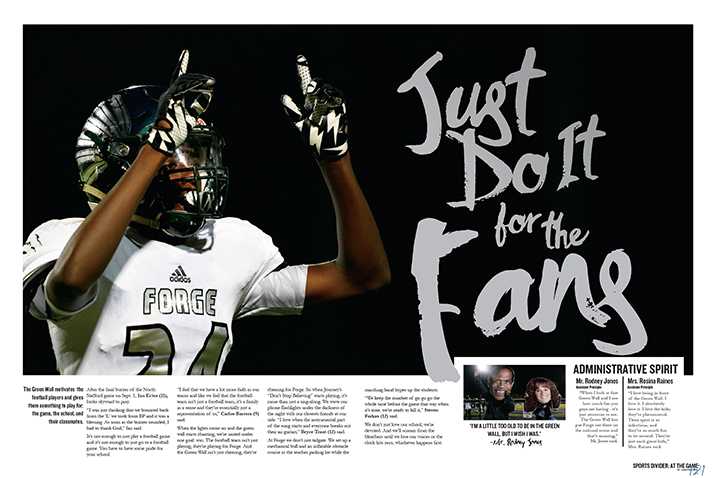 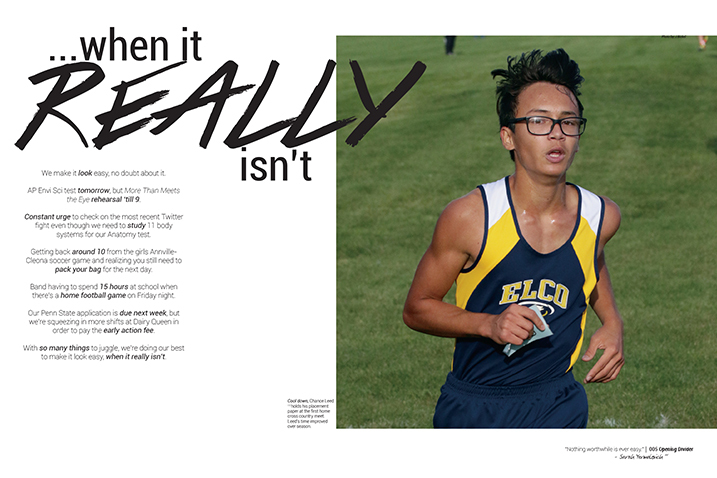 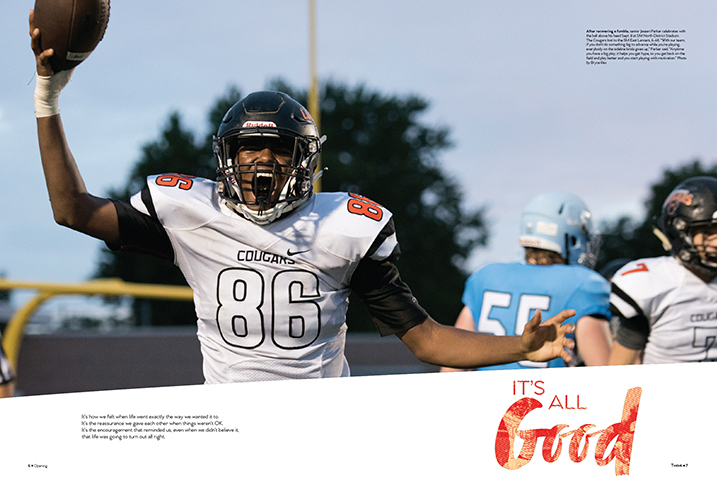 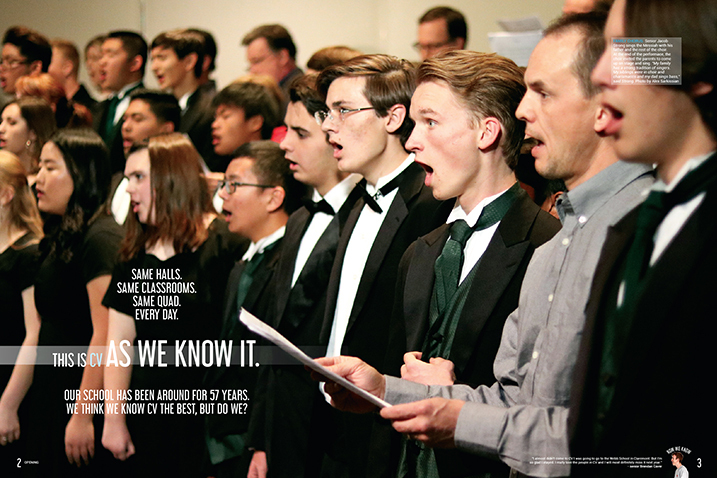 And with 2,735 students to cover, the theme enabled the staff to show how they are “All Over the Place.” On the embossed soft matte cover, the photo of student Jordan Bright looks like he’s pounding out a cadence to invite readers to march right into the book. 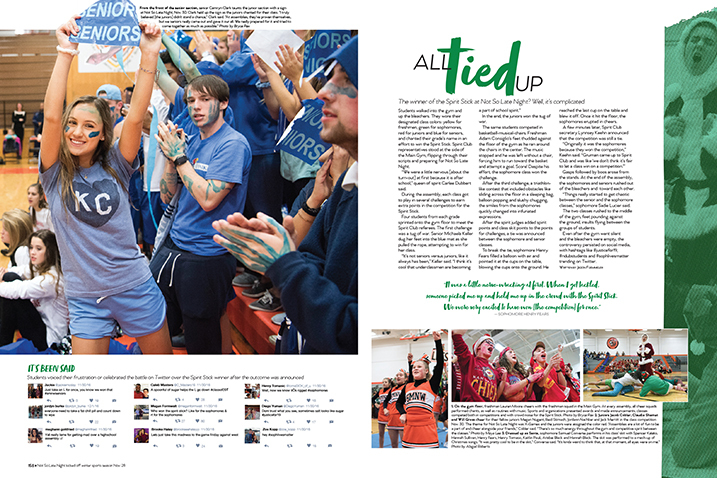 Inside, bright colors of blue, green, pink and orange, headlines in the Edo and stilu fonts, packages and lots of photos made each spread inviting. 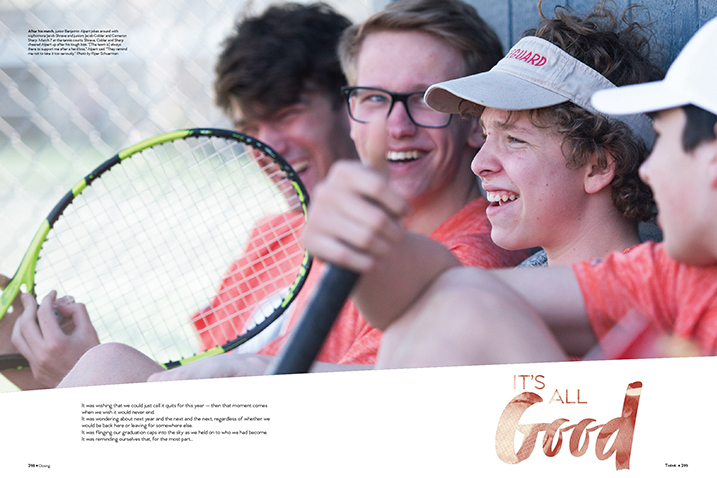 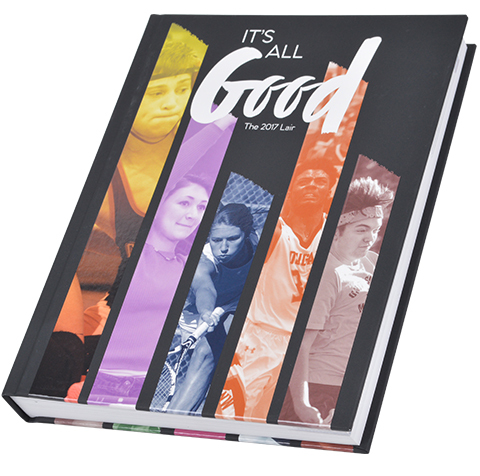 The Shawnee Mission Northwest staff chose the current, quintessential phrase “It’s All Good” as the theme of the 2017 Lair. 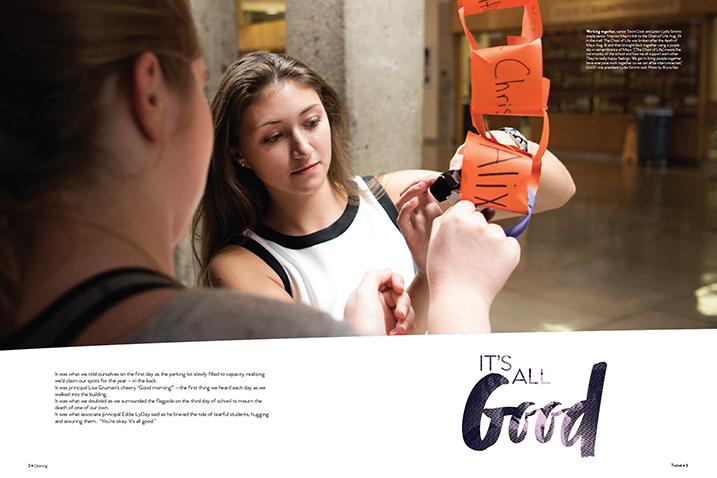 As the copy on the opening spreads explained, “It’s the encouragement that reminded us, even when we didn’t believe it, that life was going to turn out all right” which perfectly sums up the confusing combination of angst and optimism that can come with the high school years. 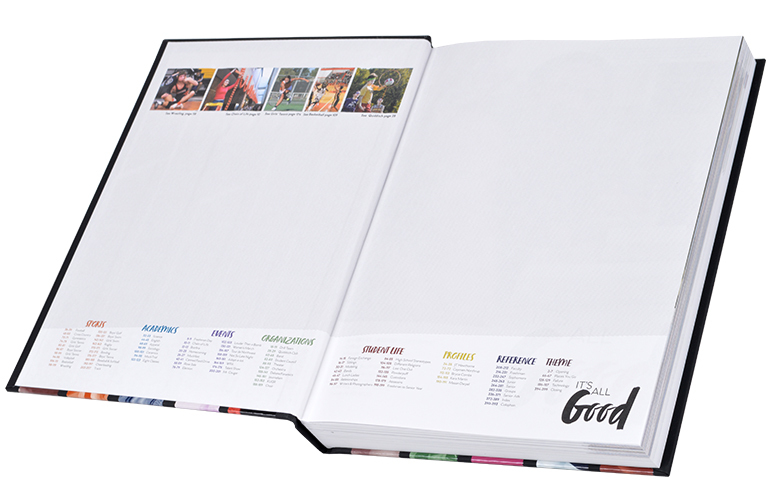 The word “Good” is emphasized in the font Zooja on the cover, and that technique is used throughout the book with emphasis given to certain words in headlines in Zooja. 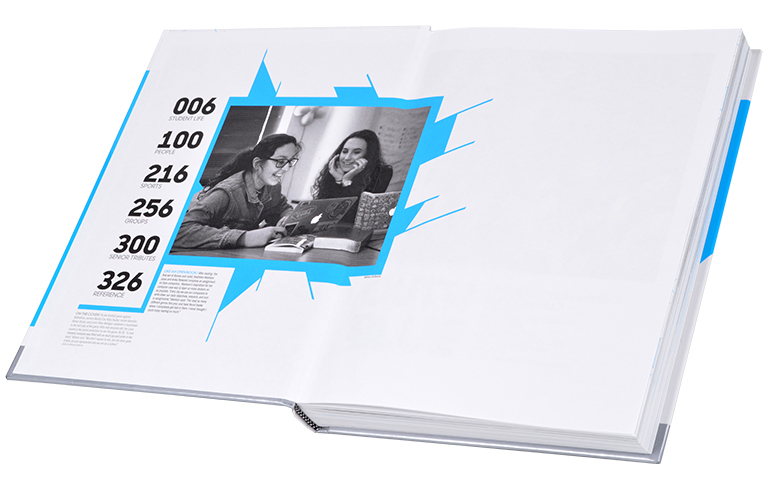 Slices of photos, all with a monochromatic effect, first appear on the cover and are used all over the book on the page edges. 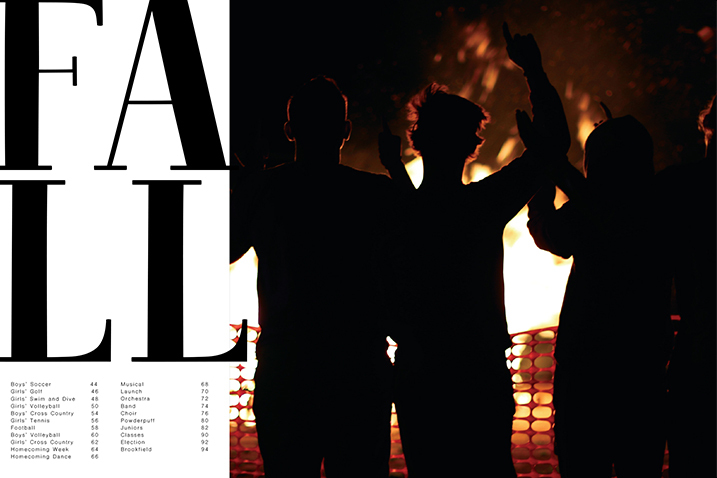 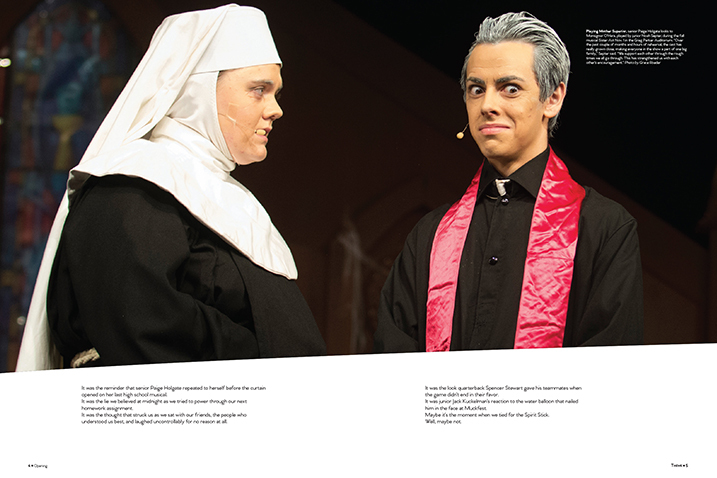 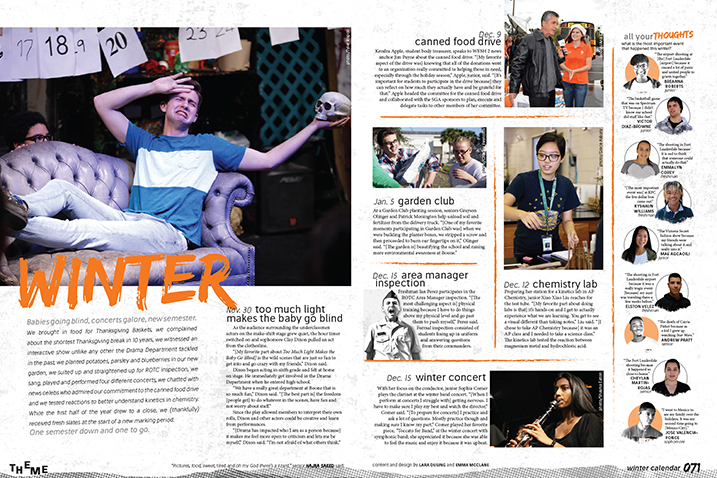 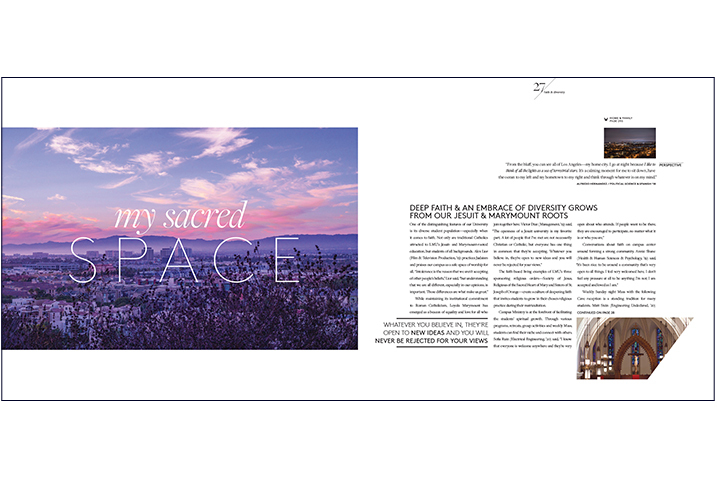 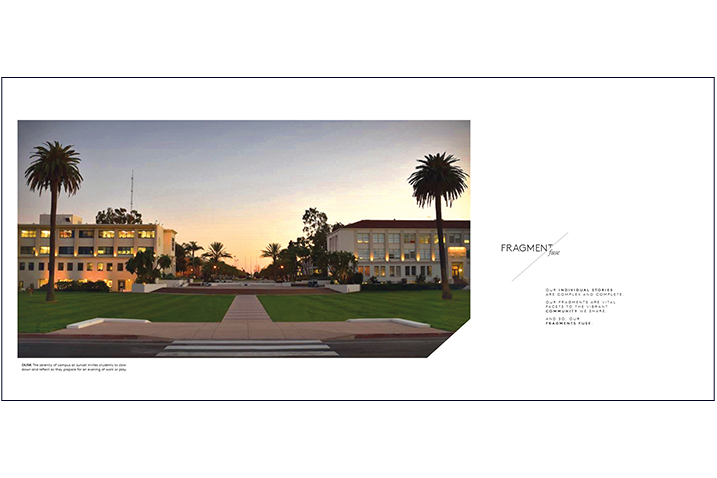 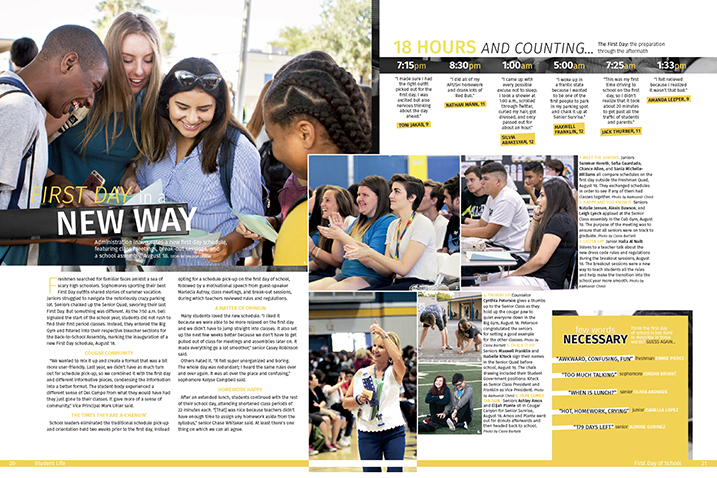 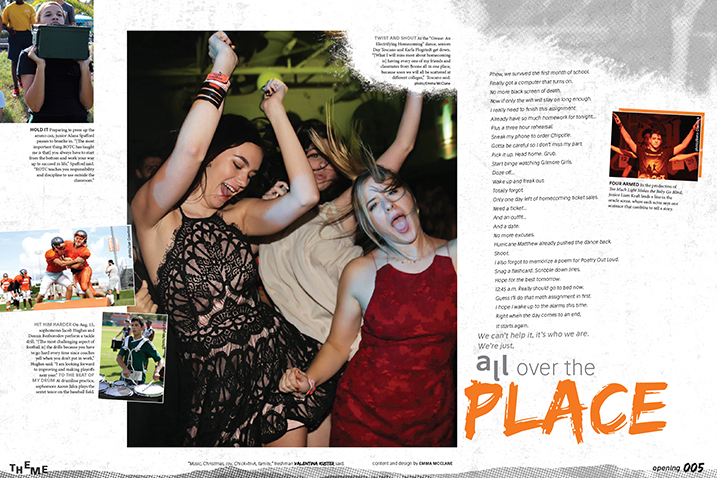 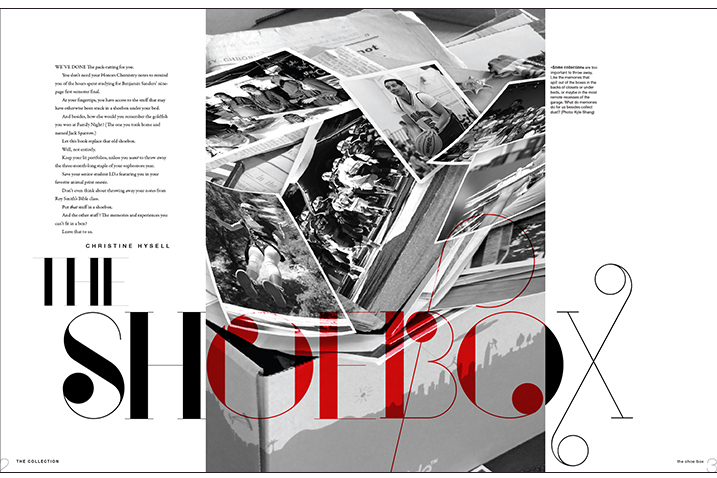 Readers get a simple, brief explanation of the theme to the 2017 Tower on the book’s very first spread when the copy tells them the individual stories of Loyola Marymount students were “complex” but the fragments of them were vital to the shared community. 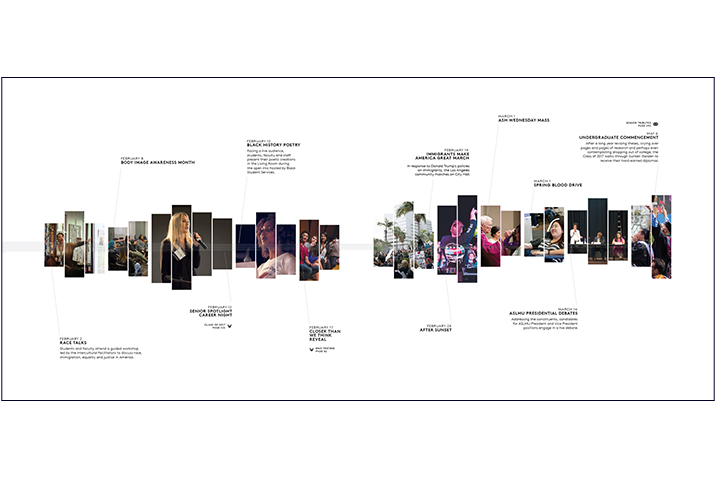 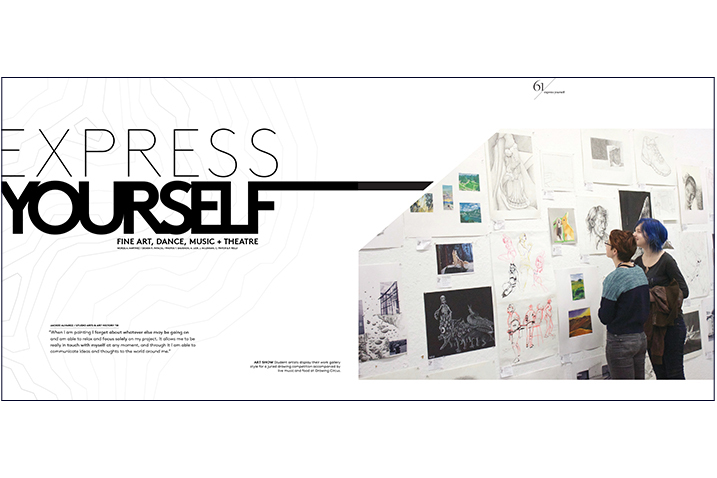 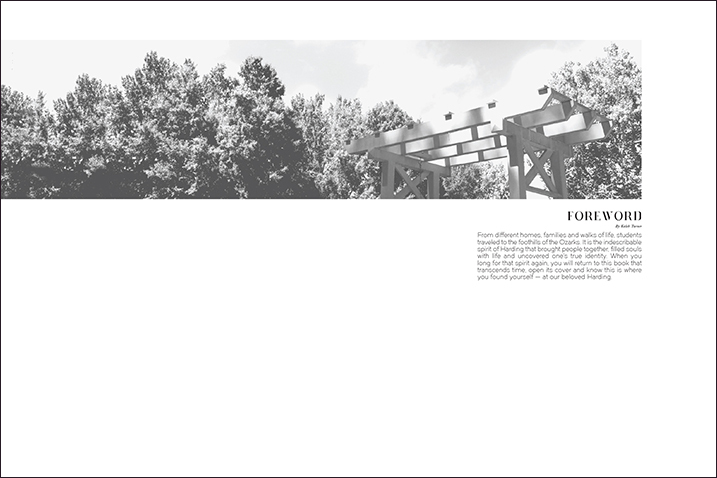 “And so, our fragments fuse.” The book’s opening spreads are a mixture of beautiful dominant photos, accompanied by quotes from students with their thoughts about LMU; and theme spreads showing slices, or fragments, of images across a timeline of important events from the year. 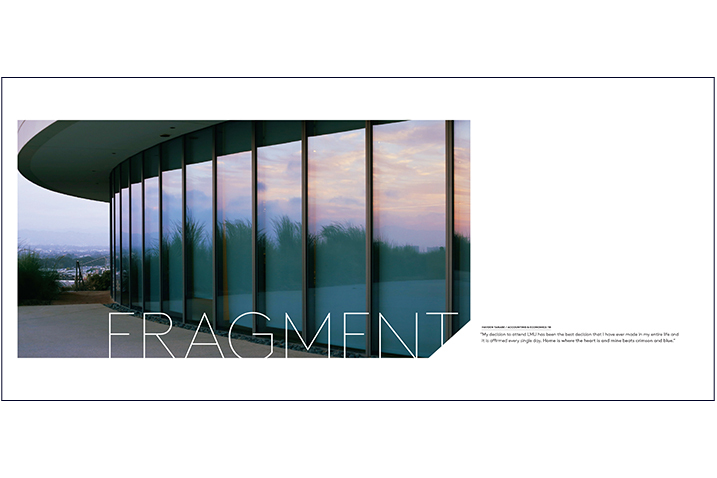 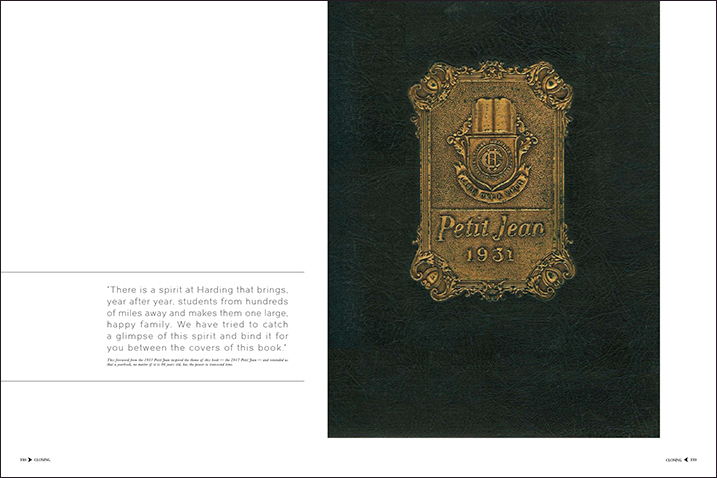 The first half of the book, or the “fragment” section, focused on events and individuals. 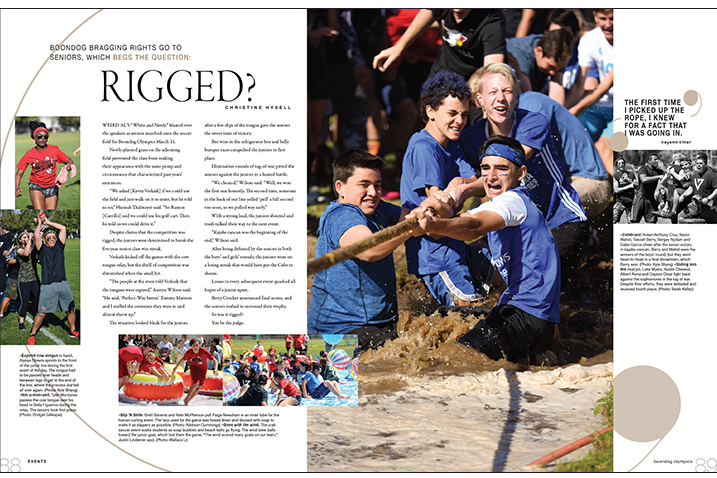 The “fuse” section in the second half covered groups, including team sports and clubs. 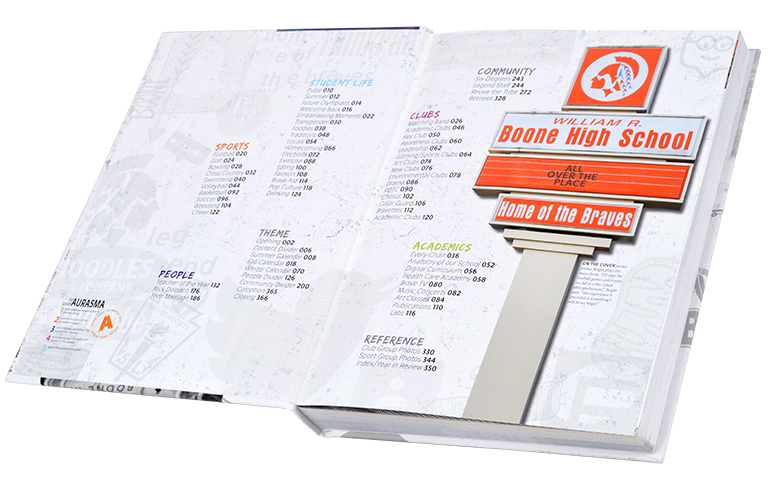 What do you do with all the memorabilia you’ve saved from high school? 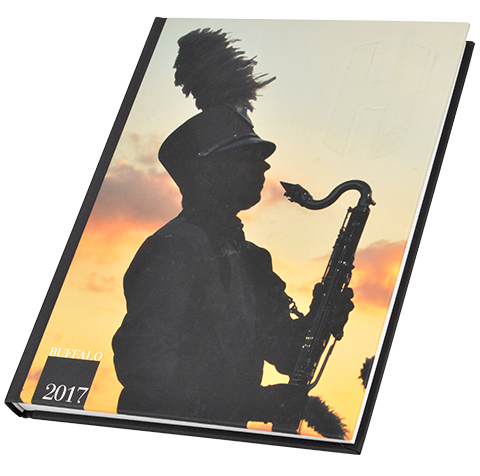 According to the 2017 Wings staff, you can keep some but throw away the rest because this book contains the “memories and experiences you can’t fit in a box.” A rich linen cover with the elegant Port font elevates the classic look of the book. 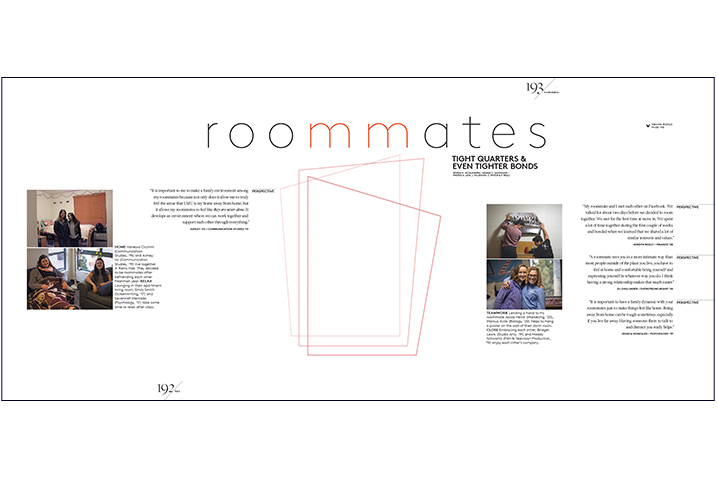 Simple spread designs with touches of color makes readers want to linger over stories of their fellow students. 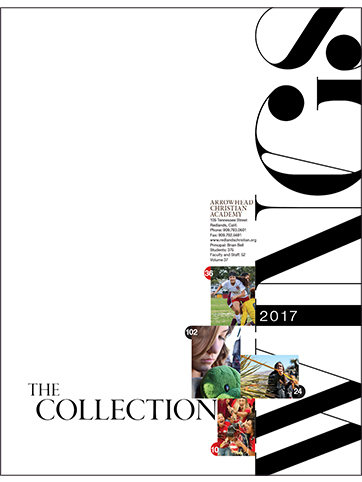 A detailed table of contents on the front endsheet guides readers through the story-driven organization format. 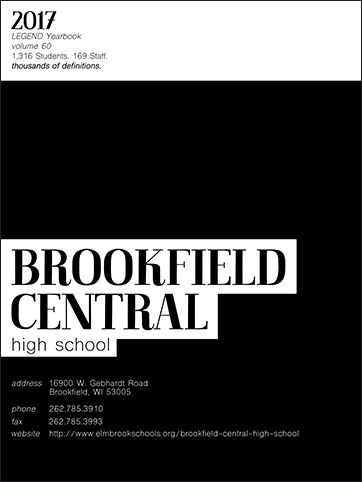 You open up the cover of the 2017 Brookfield Central Legend and you’re asked a fundamental question on the front endsheet. 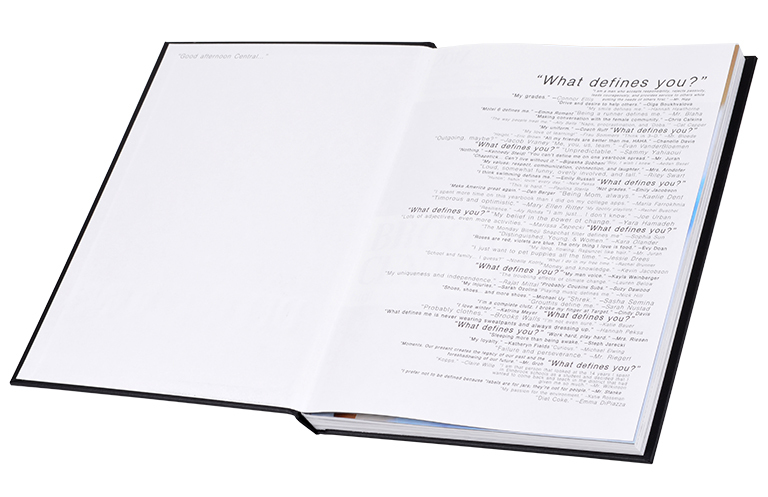 “What defines you?” The rest of the page is filled with answers to that question from dozens of Brookfield Central students, a fitting intro to the book’s theme of “Definitions.” On the book’s opening spread, the copy by editor Riley Swart further explains that “Everyone has something quirky or interesting about them. 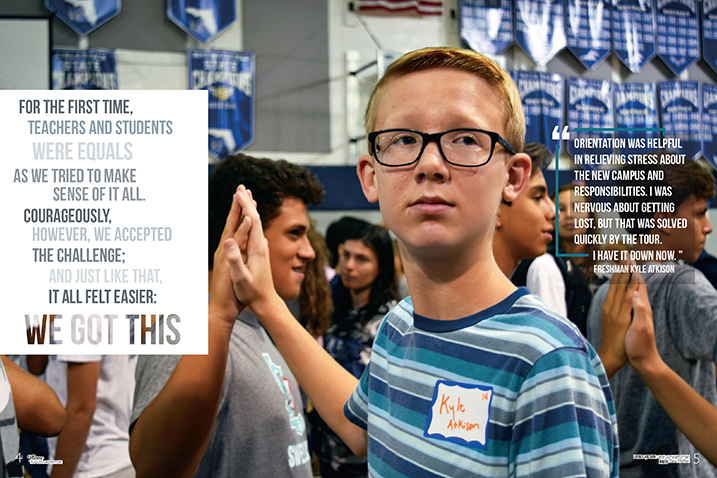 It’s time to really get to know one another. 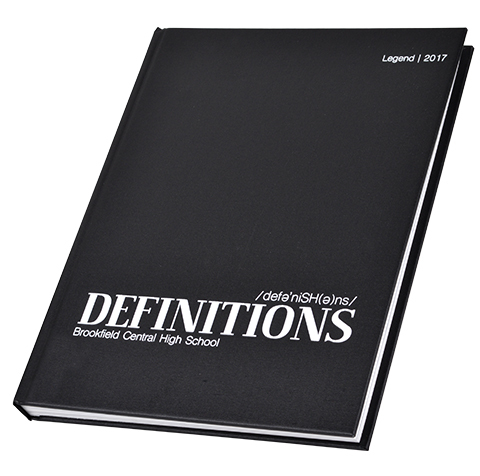 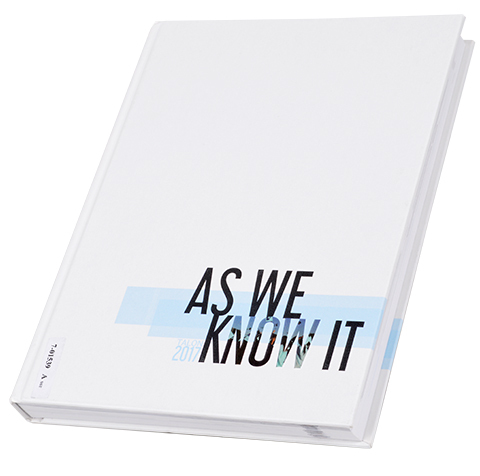 It’s time to share what defines us.” The theme word is styled on the cover like a dictionary definition, and that same style and combo of fonts is used well on headlines throughout the rest of the chronological book. 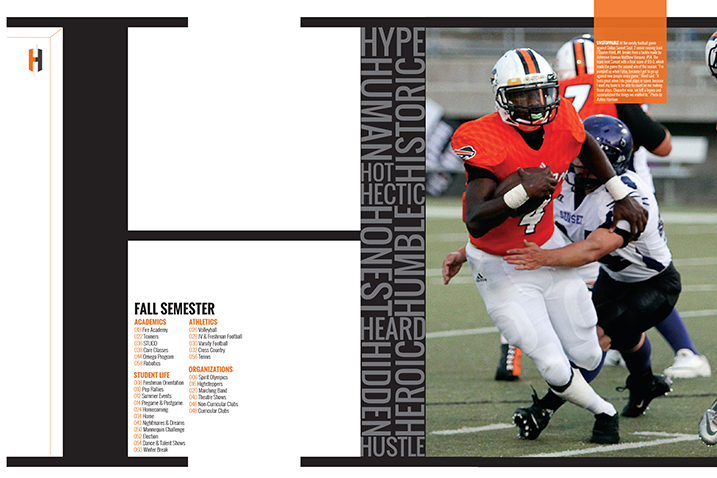 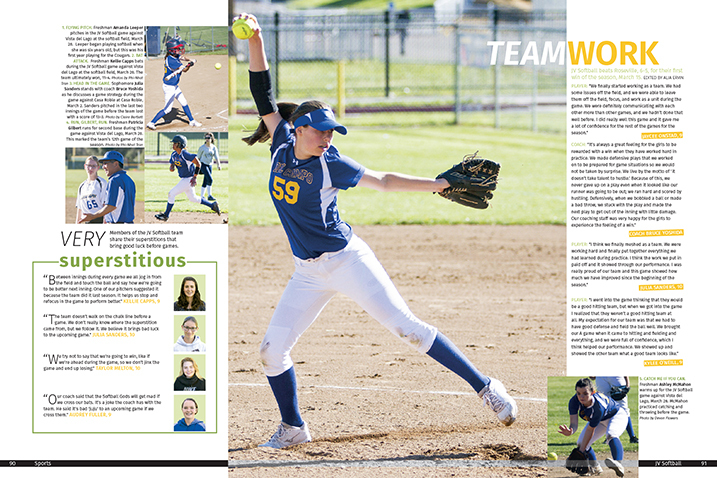 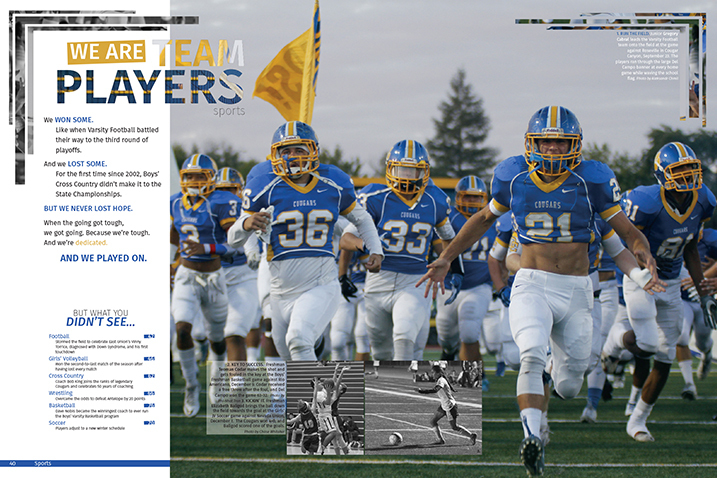 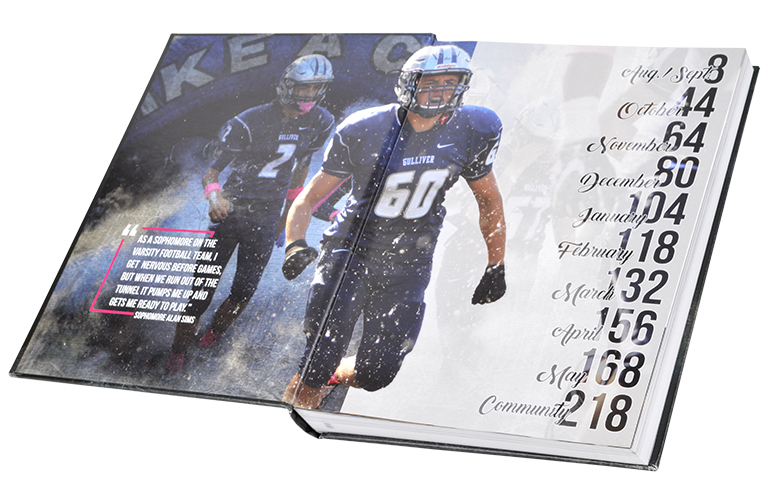 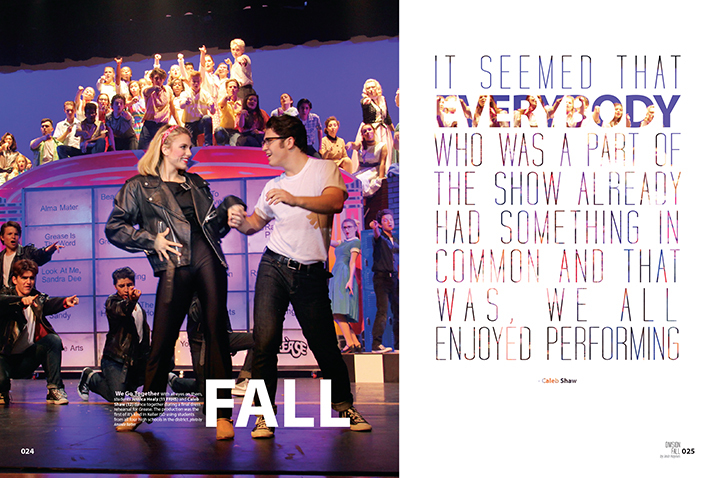 The division pages also stand out, with the seasons printed in huge block letters and interesting dominant photos. 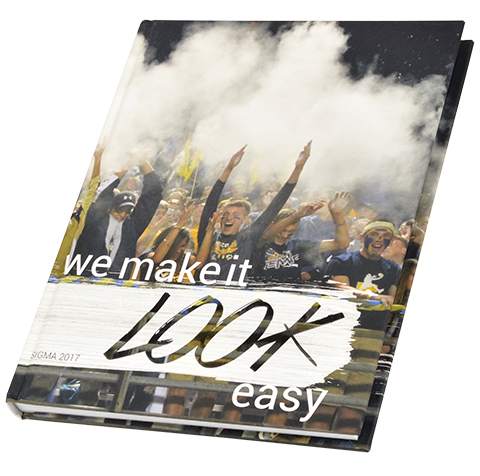 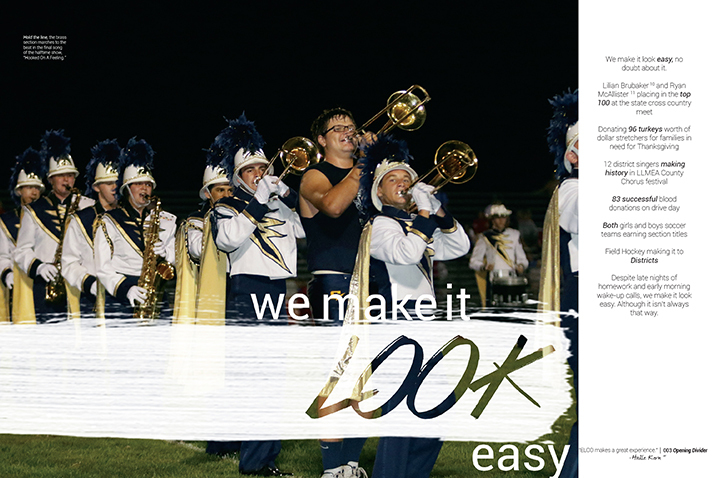 To focus on the successes of the students and the school, the staff of the 2017 Sigma chose “We make it look easy” as their theme. 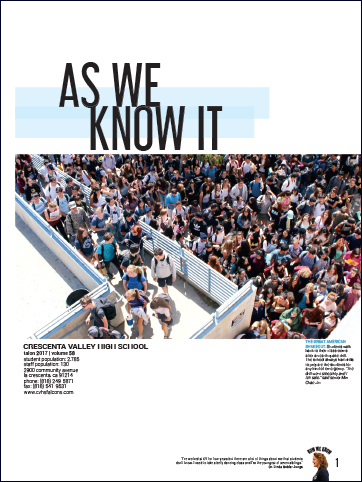 However, the opening copy acknowledges that sometimes it’s hard, and the coverage acknowledges both the successes and difficulties of the daily lives of teens. 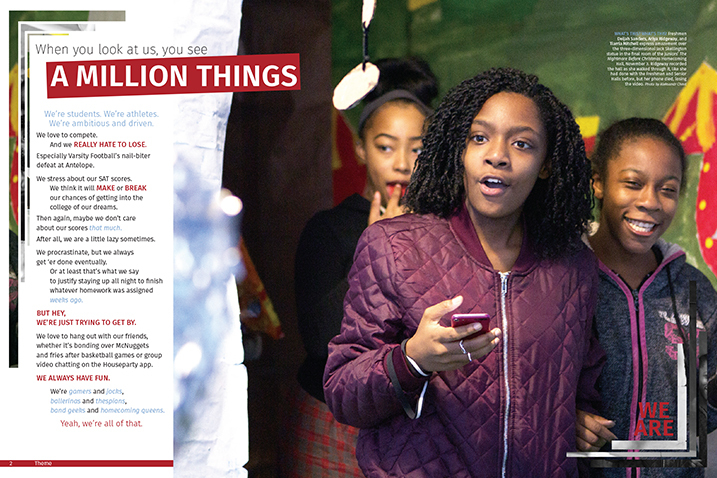 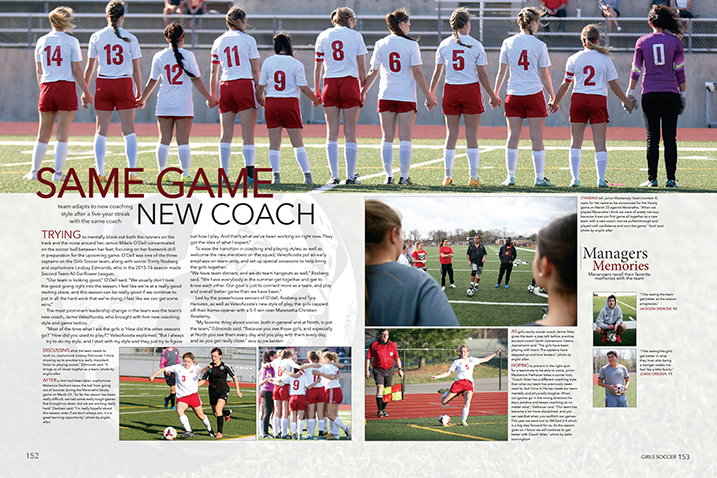 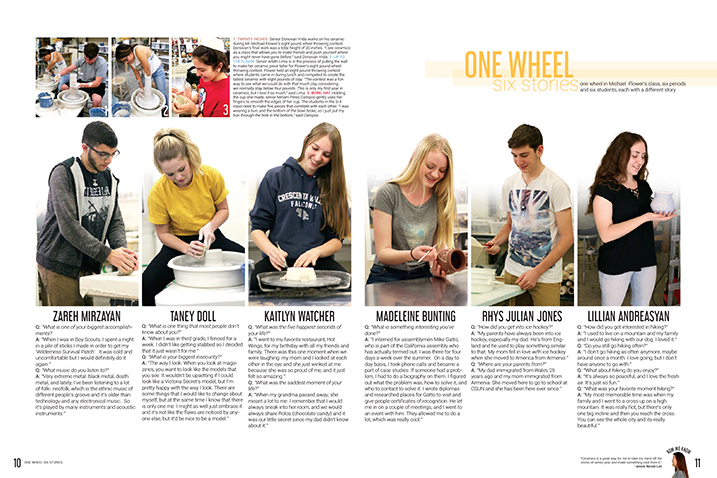 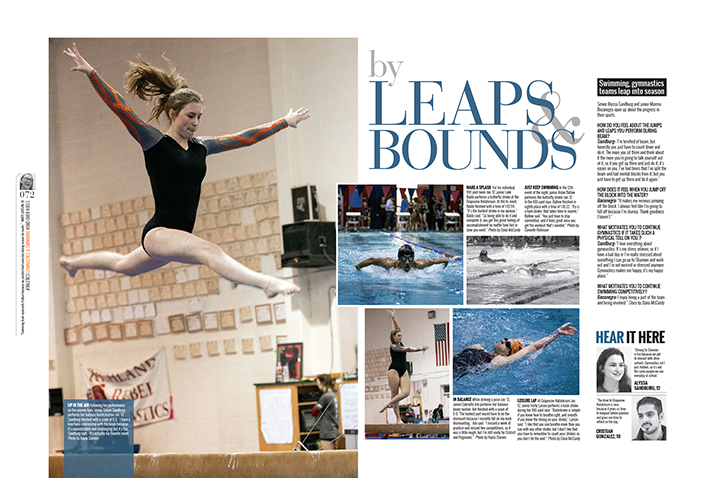 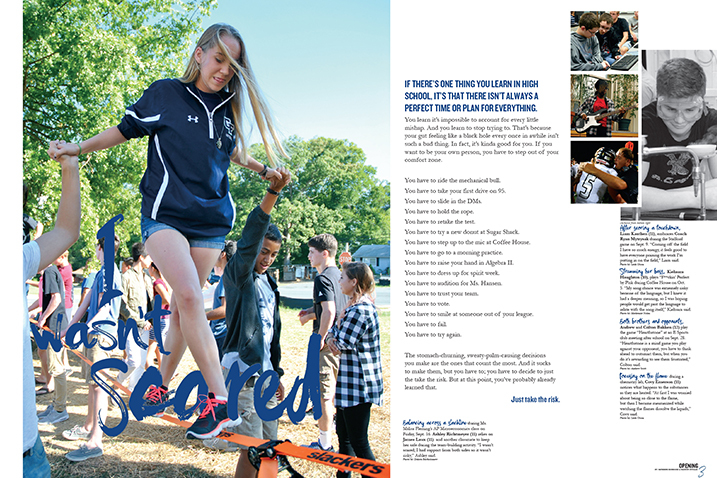 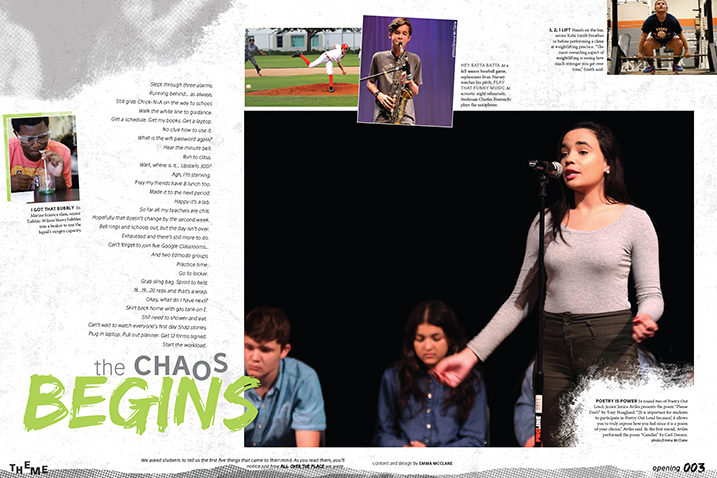 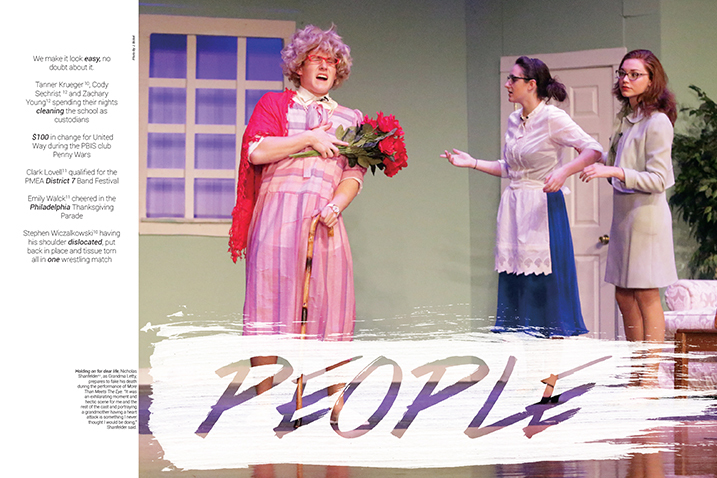 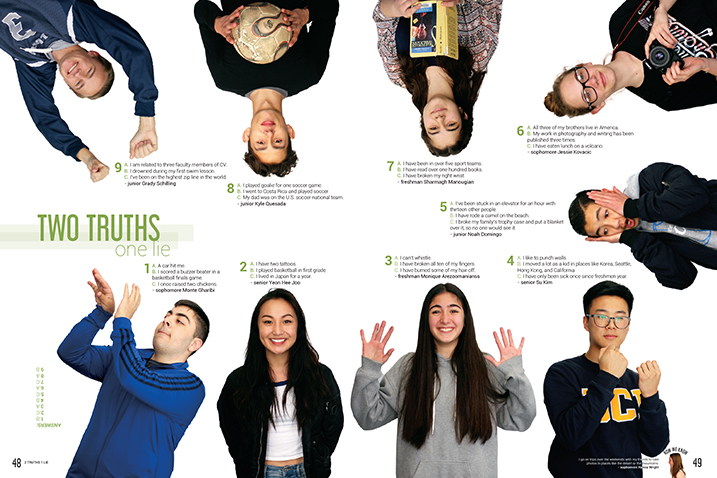 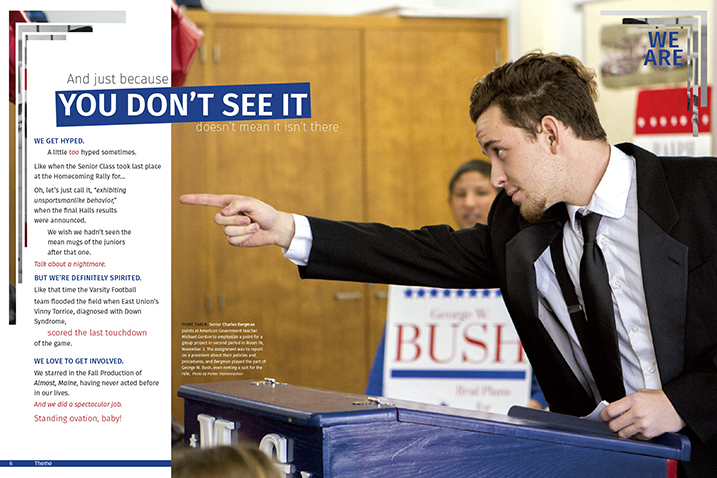 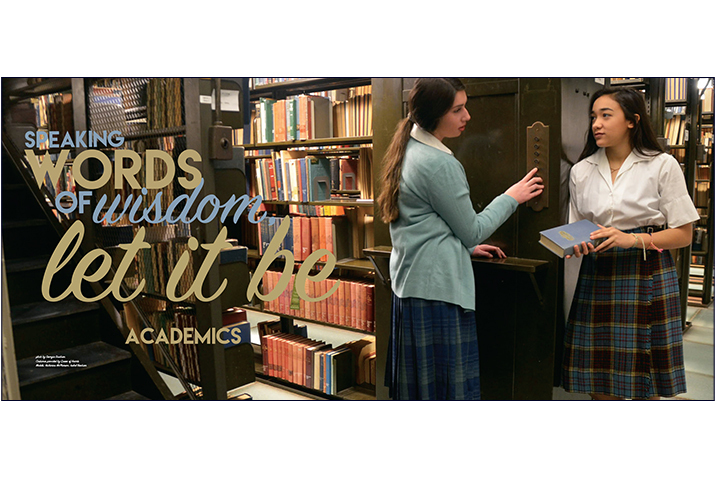 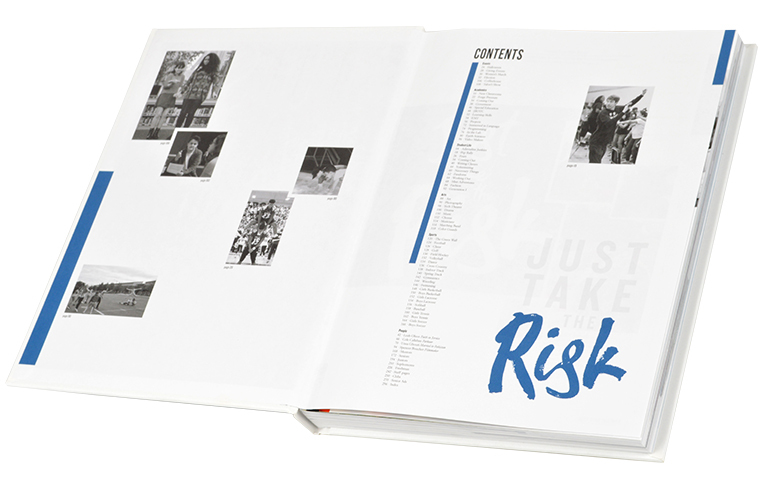 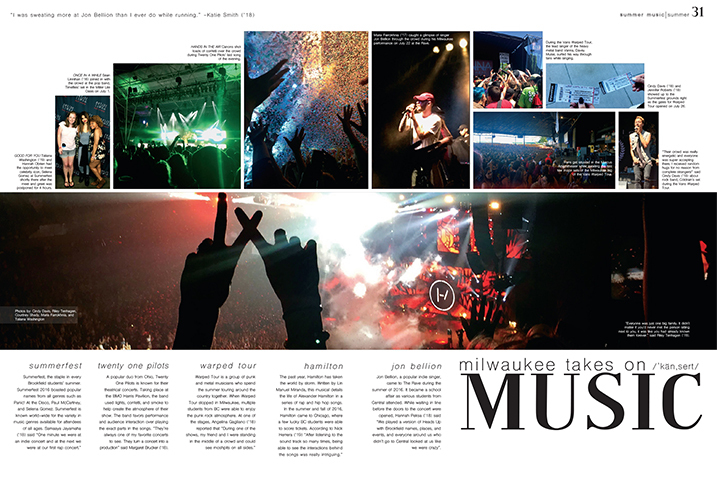 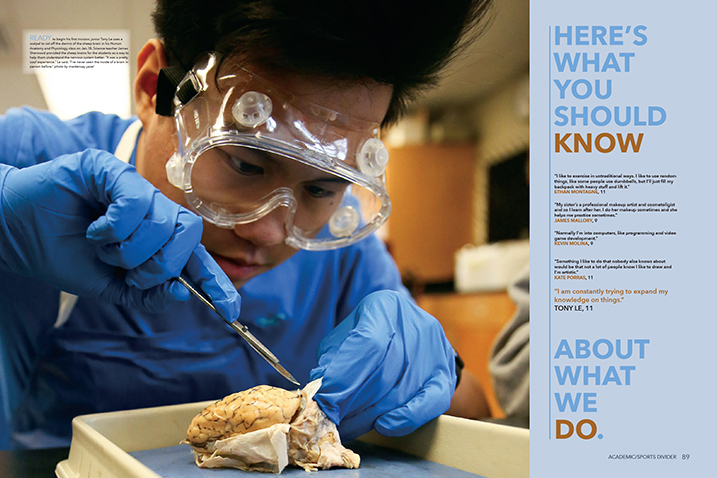 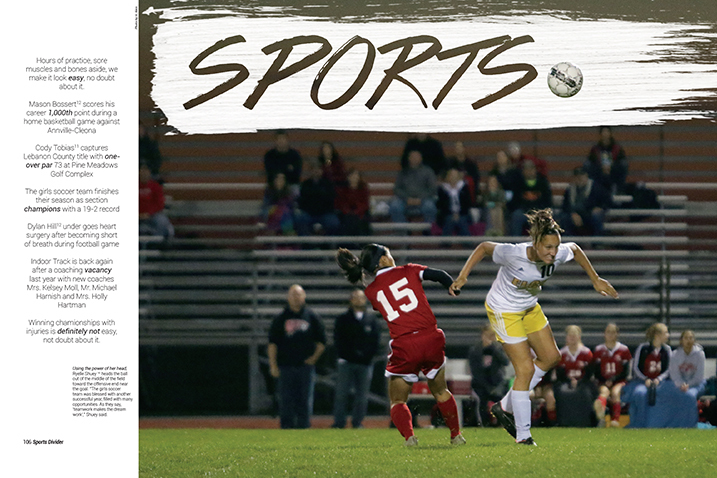 Using lots of photos and quotes on spreads with bold headlines, this traditionally organized book feels like it didn’t miss a moment of what students were up to during the year. 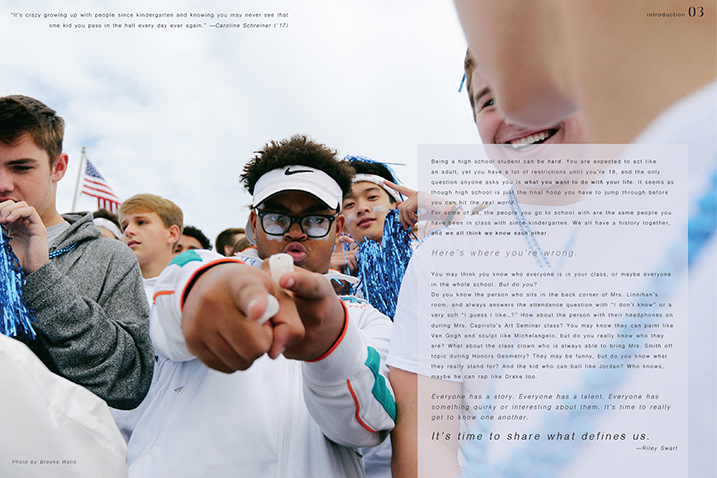 The staff also used a cool identifying technique, putting the grade level in superscript after a student’s name (e.g., Haille Kern, 11).